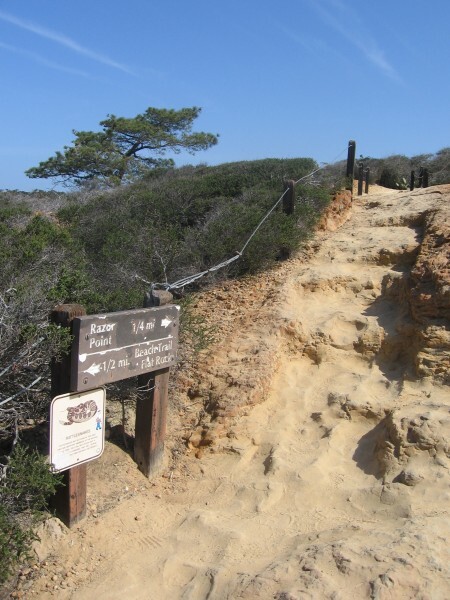 torrey pines – Cool San Diego Sights! 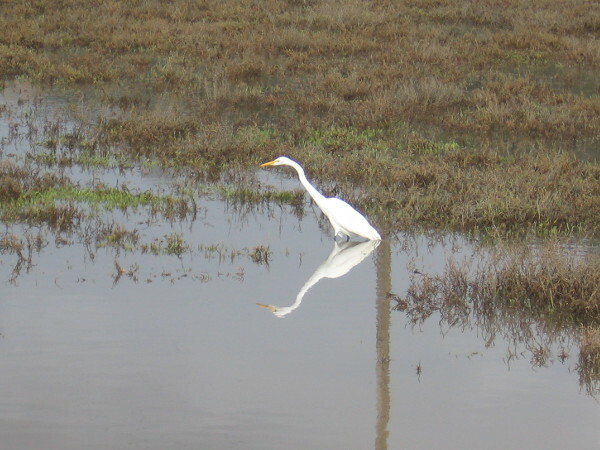 Posted on February 3, 2019 February 4, 2019 Tags beaches, beautiful, birds, bridges, environment, nature, pacific ocean, photography, state parks, storms, surf, torrey pines, water, winterLeave a comment on Los Peñasquitos Lagoon between winter storms. Street art on Torrey Pines Road near UCSD. 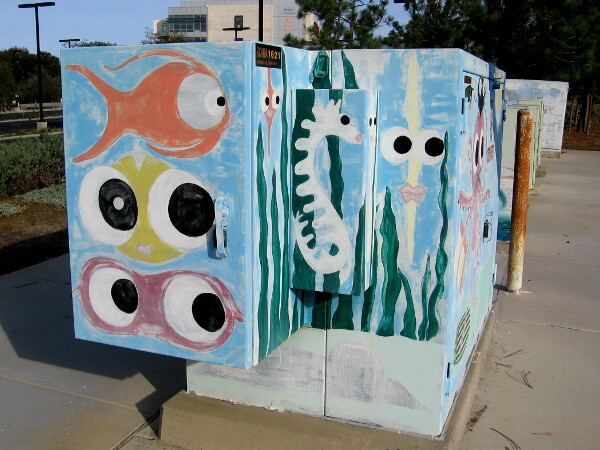 Electrical box on North Torrey Pines Road near the Gliderport intersection features colorful fish with huge eyeballs! 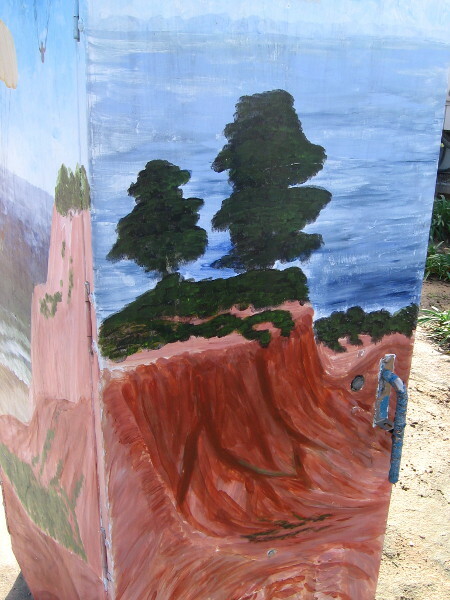 As I headed up the sidewalk along North Torrey Pines Road back to my car, I spied all sorts of creative street art painted on utility boxes and transformers. In many instances, I believe, the art was produced by students at the university. 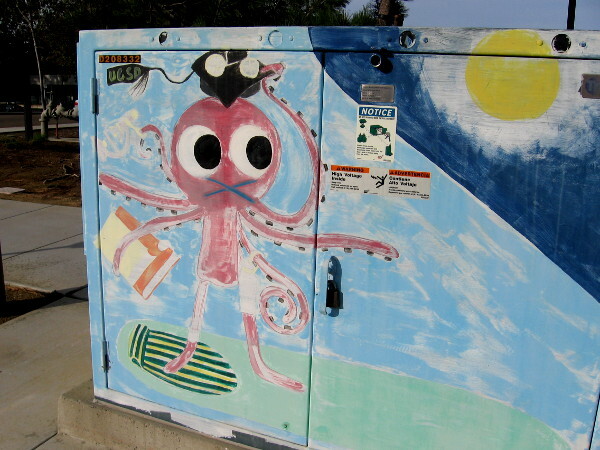 Across from the North Campus of UCSD, this octopus carrying a book and donning a graduation cap is also riding a surfboard! 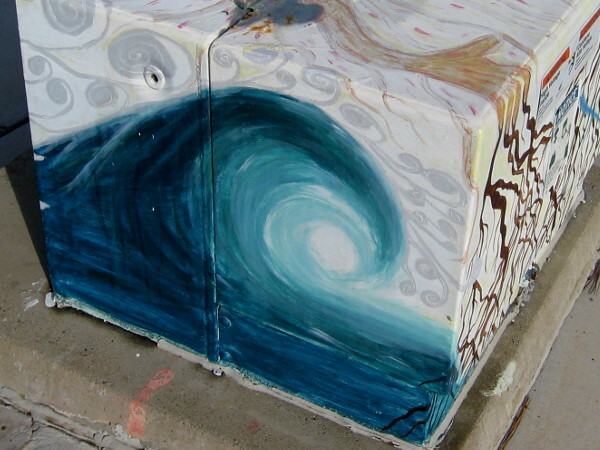 Another nearby box features street art in the form of a breaking ocean wave. 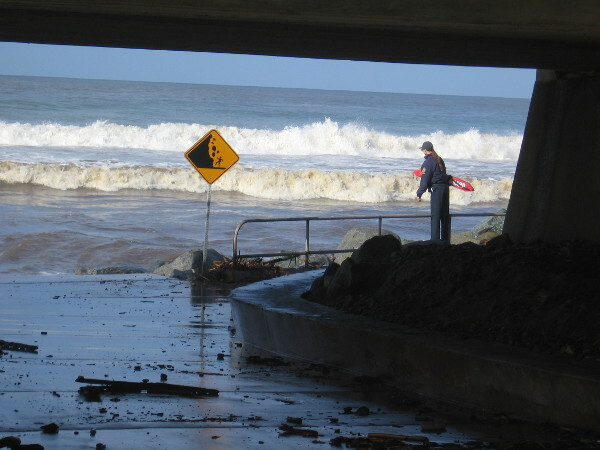 Excellent surfing can be found nearby at Black’s Beach. 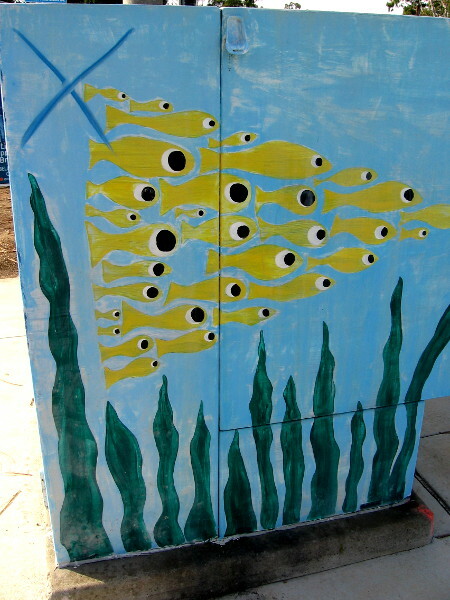 Another side of the big utility box has yellow fish forming a triangle as they swim above seaweed. 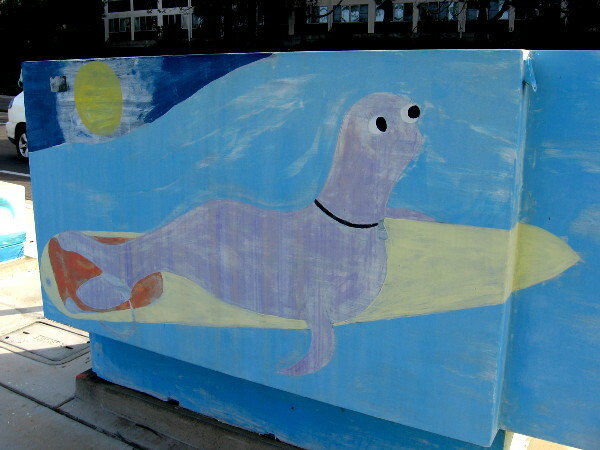 And lastly we see a purple seal on a surfboard! 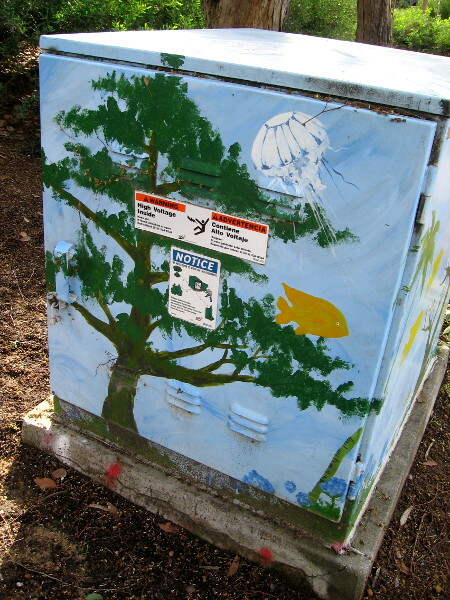 Another corner of the same intersection has a utility box with four cool images. 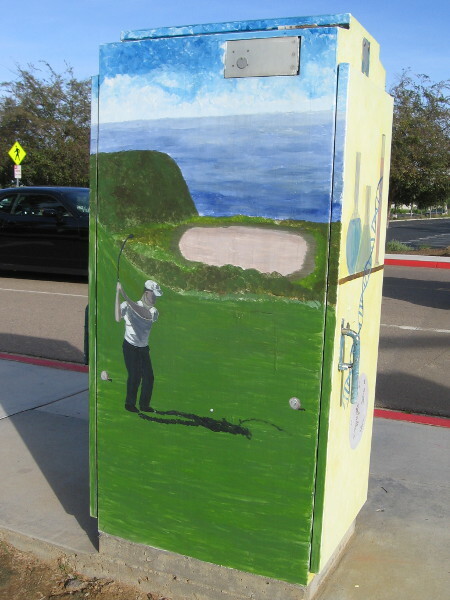 This side shows a golfer taking a swing at the nearby Torrey Pines Golf Course. On this side we see the interior of a biotechnology lab. Of course, the internationally famous Salk Institute building is about a 30 second walk from here! 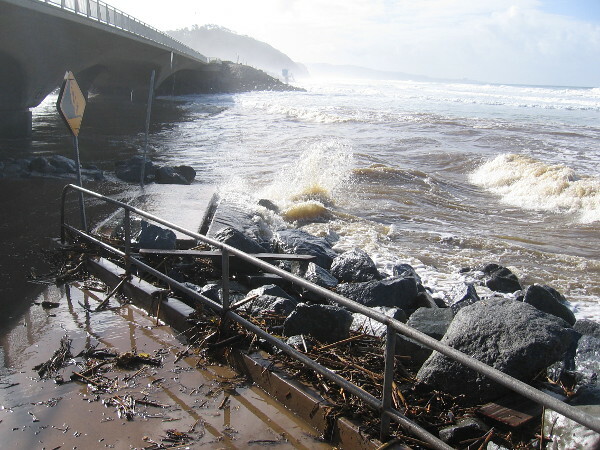 You can just glimpse a part of the parking lot in this photo. Stay tuned to this blog for more! 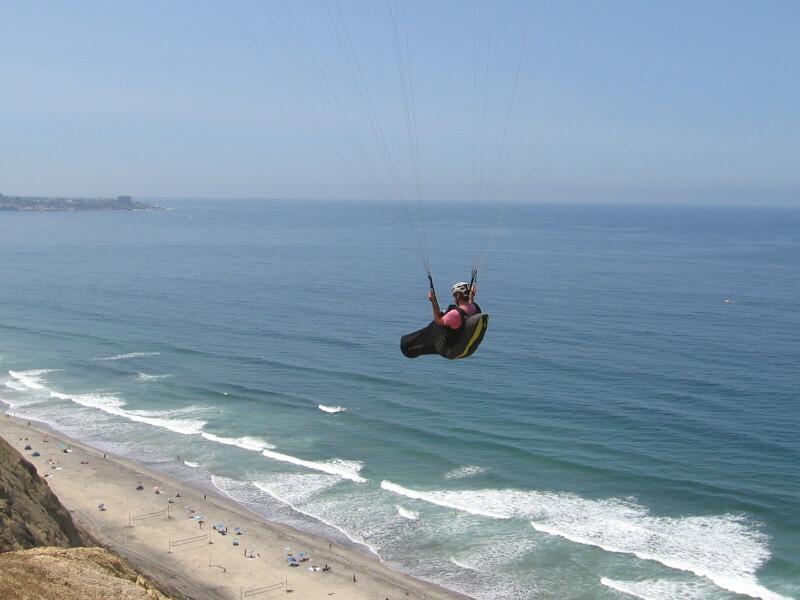 Also nearby is the Torrey Pines Gliderport. 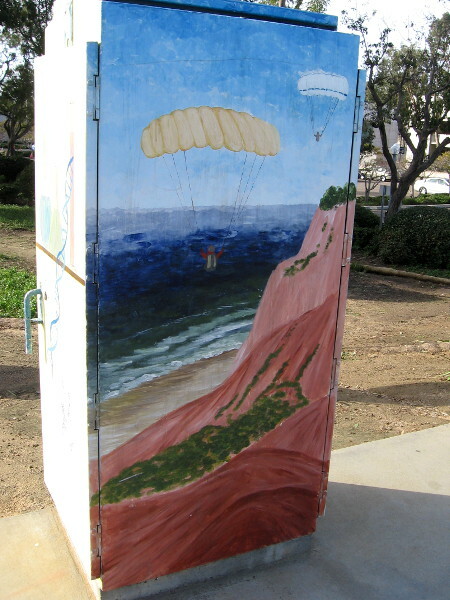 This fun street art depicts a couple of paragliders soaring above the Pacific Ocean! The Gliderport is one of my favorite places. 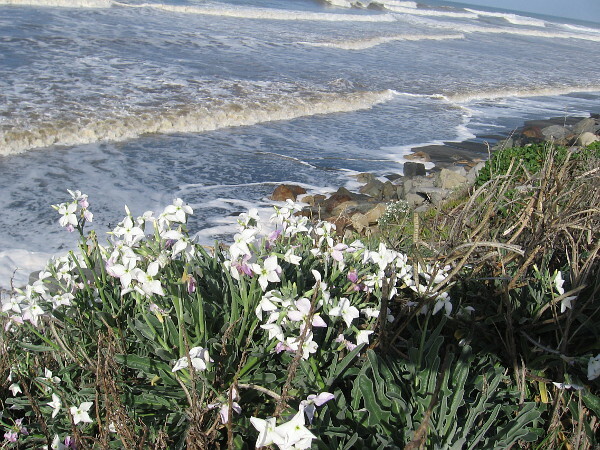 The fourth side of the box shows the natural beauty along the coast of La Jolla. 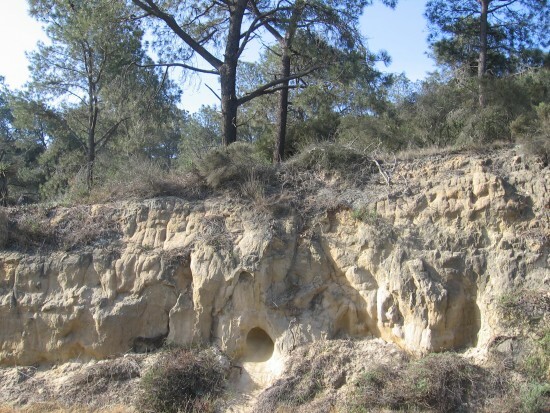 Pine trees rise atop eroded sandstone cliffs. 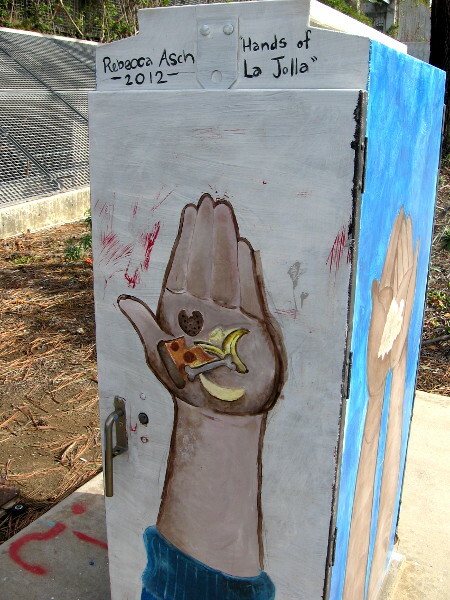 Now for some more street art along North Torrey Pines Road. I took this photo while walking along the sidewalk. 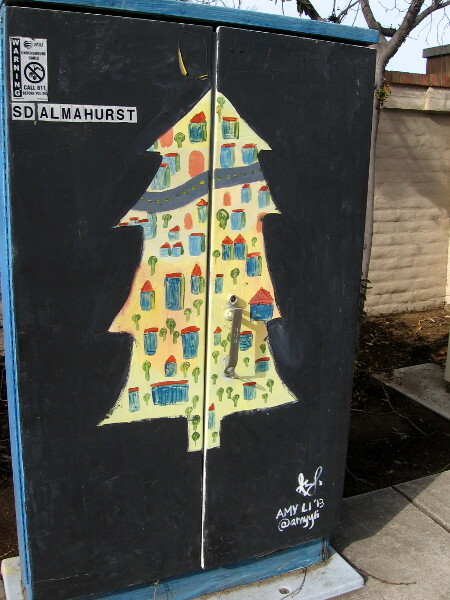 This urban art looks to me like a city inside the outline of a Christmas tree. 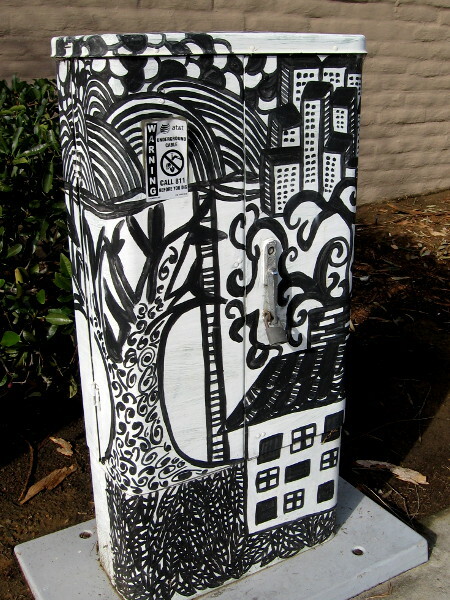 More great urban street art on a utility box. Wisdom written for all to see. 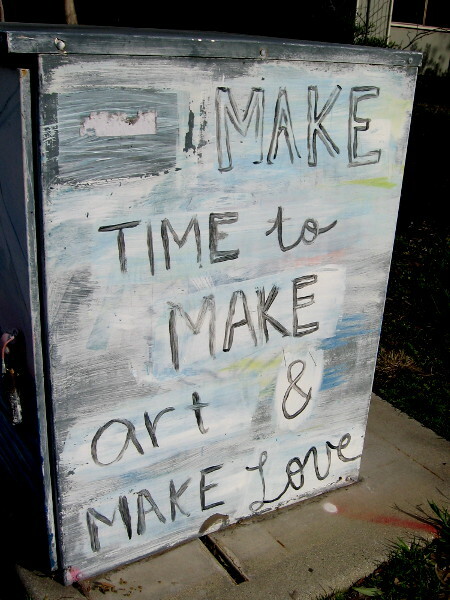 Make time to make art and make love. 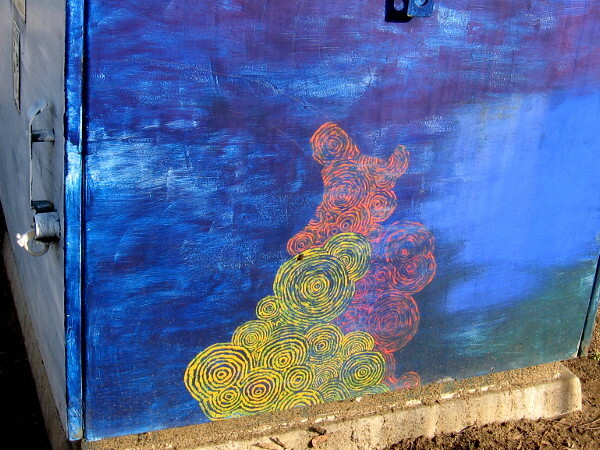 On the next side of this box we see a hand with brush, making beautiful art. 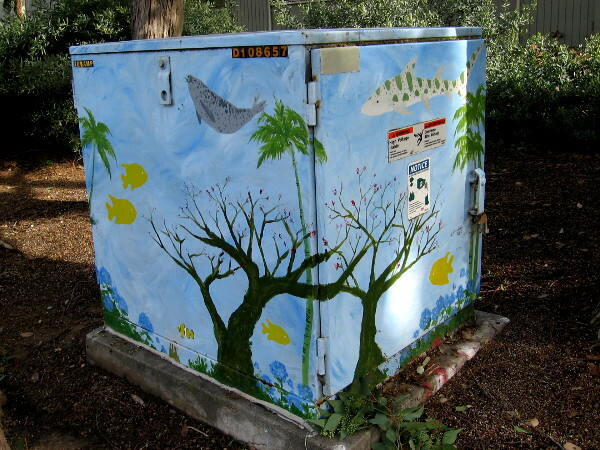 A transformer box with fish and whales swimming among trees and flowers! 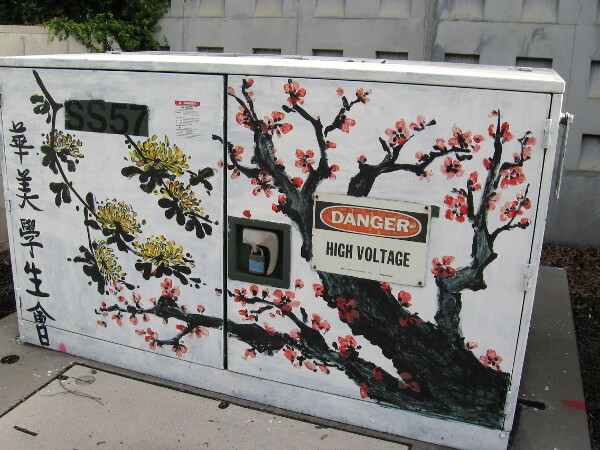 Human creativity expressed in public with paint. 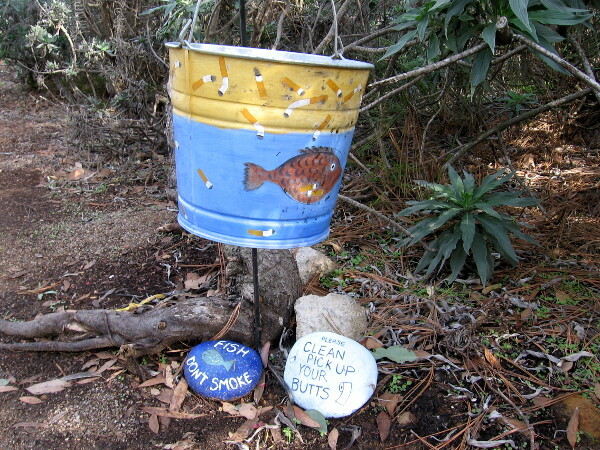 A bucket for cigarette butts next to the sidewalk. Fish! Don’t Smoke! Now that was an unexpected discovery! 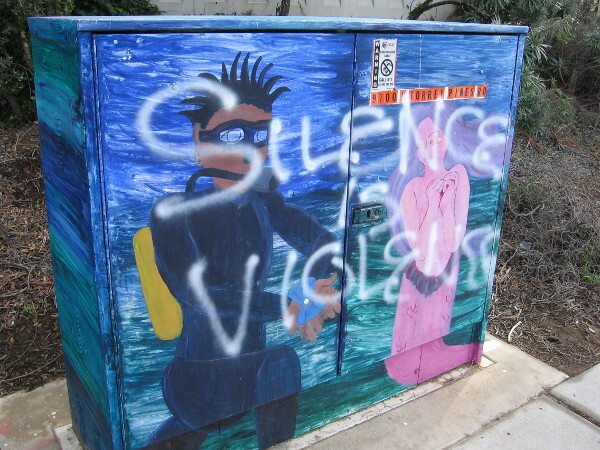 One side of a box near an entrance to UCSD. 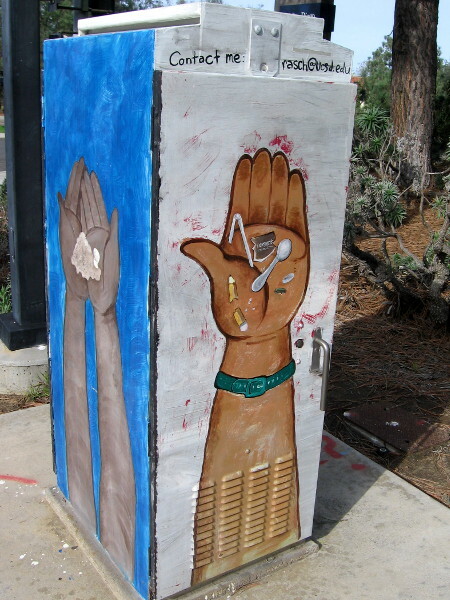 Hands of La Jolla by Rebecca Asch. It’s holding food. Another hand. A broken pencil and perhaps caffeine for those late nights of studying. An underwater guy in scuba gear and a pink mermaid seem to be in love. The spray painted words Silence is Violence probably was applied later, or perhaps not. Colorful blooms on branches. I think those might be Japanese cherry blossoms on the right. 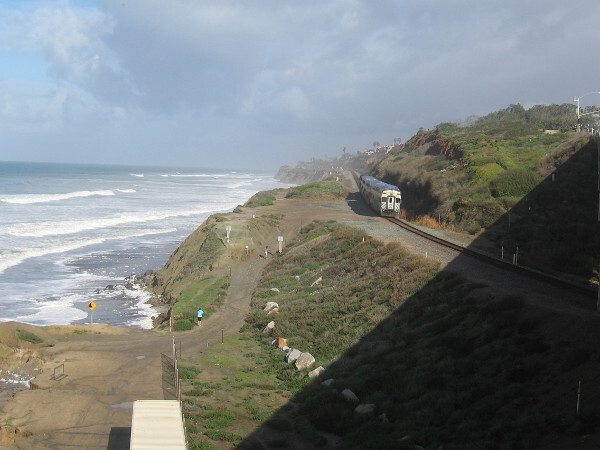 There are many crows (and seagulls) that flock in this coastal cliff area near UCSD. They perch on lampposts all over the place. 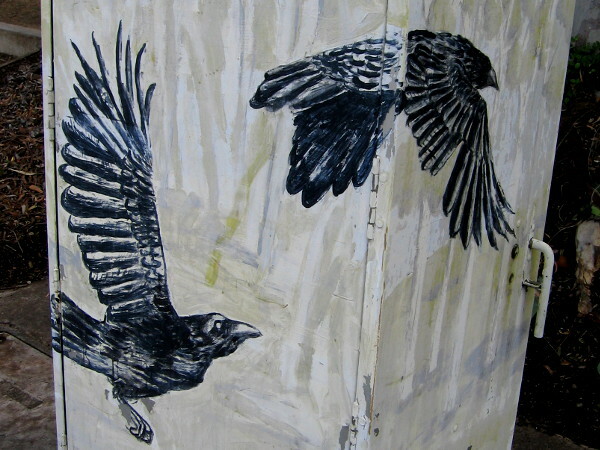 Crows are taking flight right here, as well! 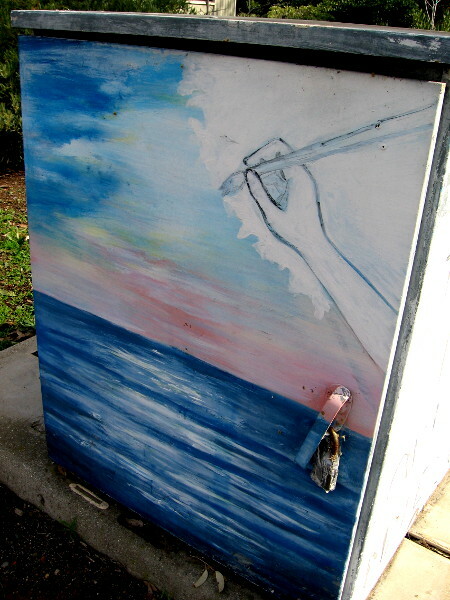 More cool street art. 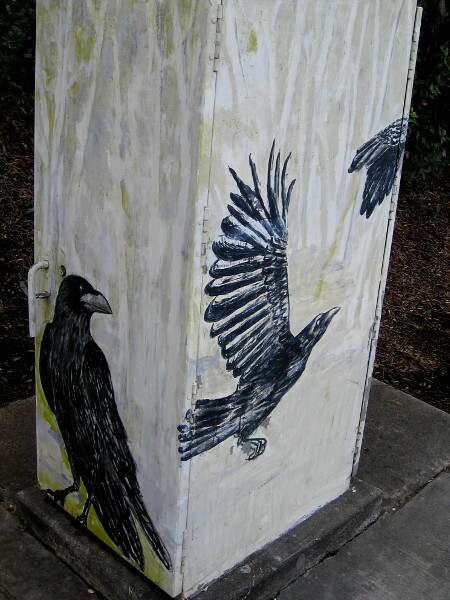 Two crows fly across the angled sides of a utility box on North Torrey Pines Road. 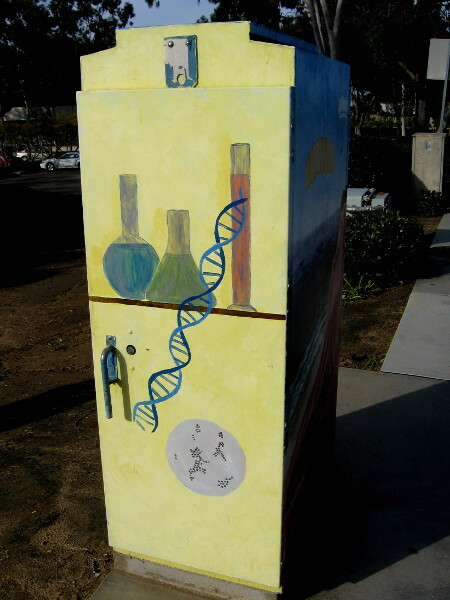 Posted on December 26, 2016 December 26, 2016 Tags art, artists, color, cool, creativity, education, fish, la jolla, photography, street art, torrey pines, ucsd, urban art, walking7 Comments on Street art on Torrey Pines Road near UCSD. 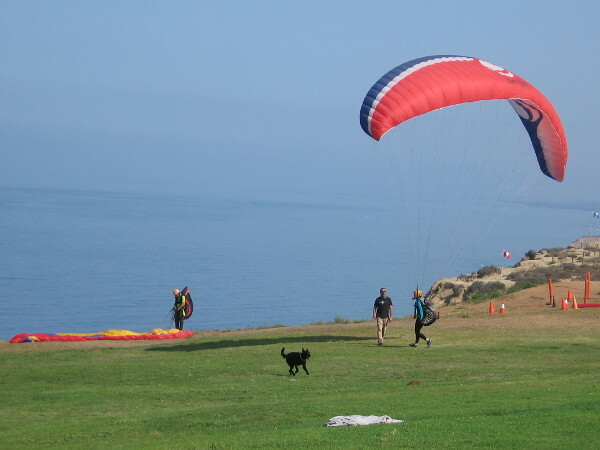 Taking flight at the Torrey Pines Gliderport! 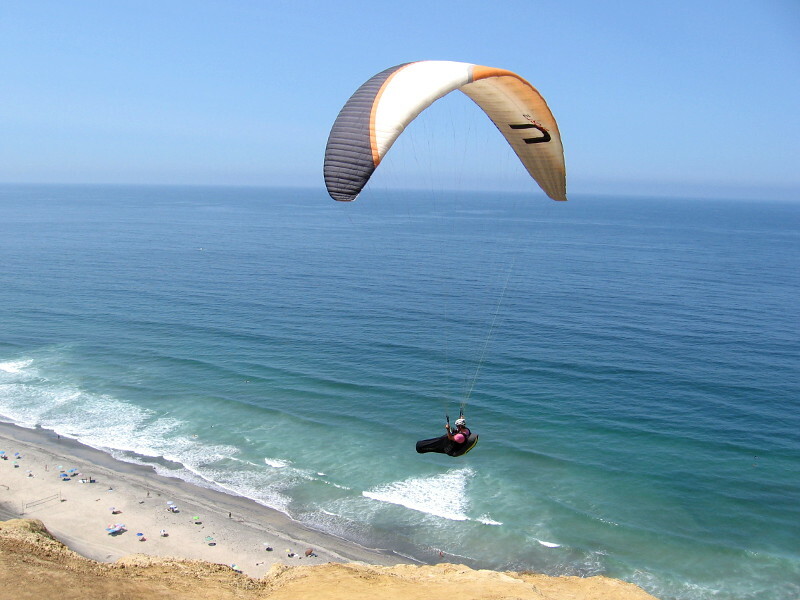 Paraglider high above the Pacific Ocean catches a warm summer updraft created by sandstone cliffs at San Diego’s famous Torrey Pines Gliderport. 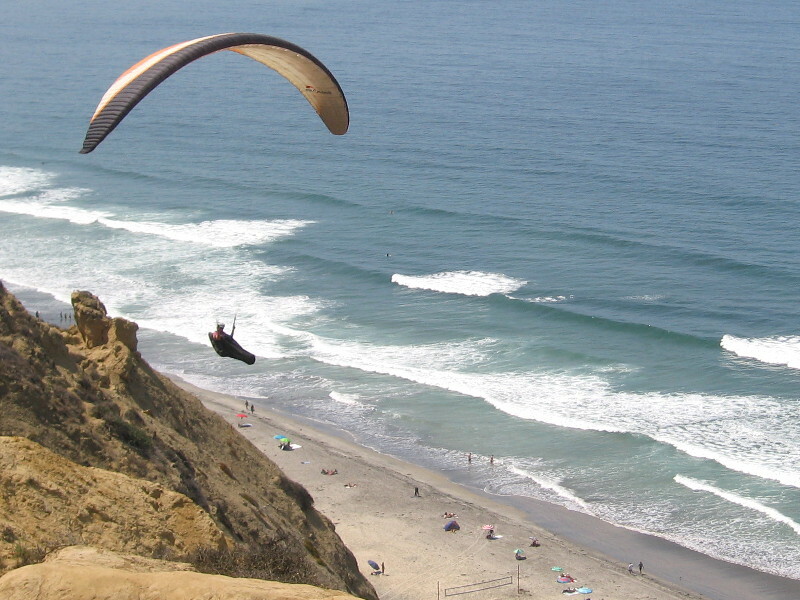 The world-famous Torrey Pines Gliderport is possibly the coolest, most awesome place in all of San Diego. 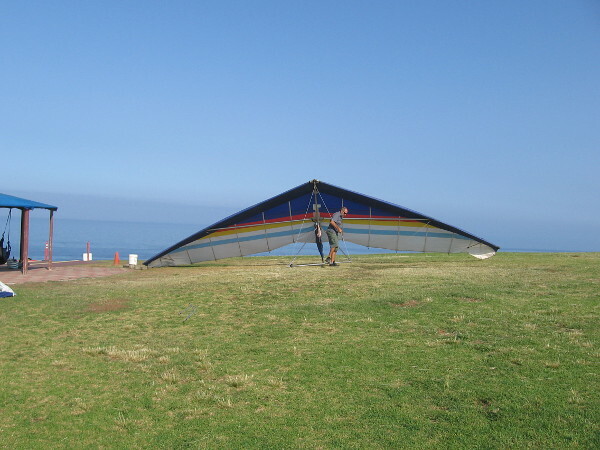 Hang gliders and paragliders float silently in the sky above rugged sandstone cliffs and the blue Pacific Ocean, painting a rare scene that few will ever forget. Here are some photos that I took this morning. 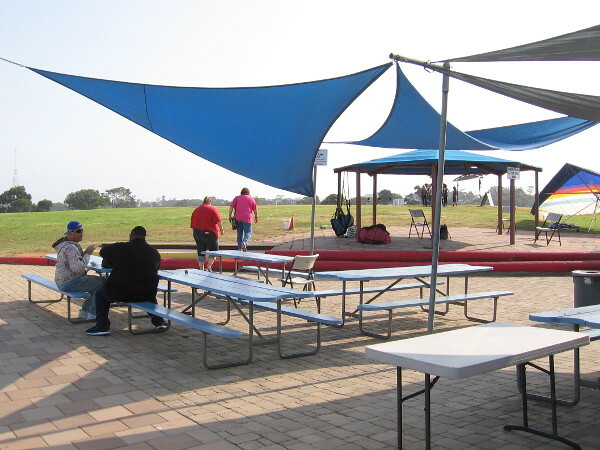 I arrived too early–the wind necessary to sustain gliders, I learned, doesn’t usually kick in until about 11:30. No worries. There were so many interesting things to photograph, and the weather and scenery were so pleasant, I just moseyed around and sat here and there and let each moment unfold. Please enjoy the following photos and make sure to read the captions for more detailed explanations! 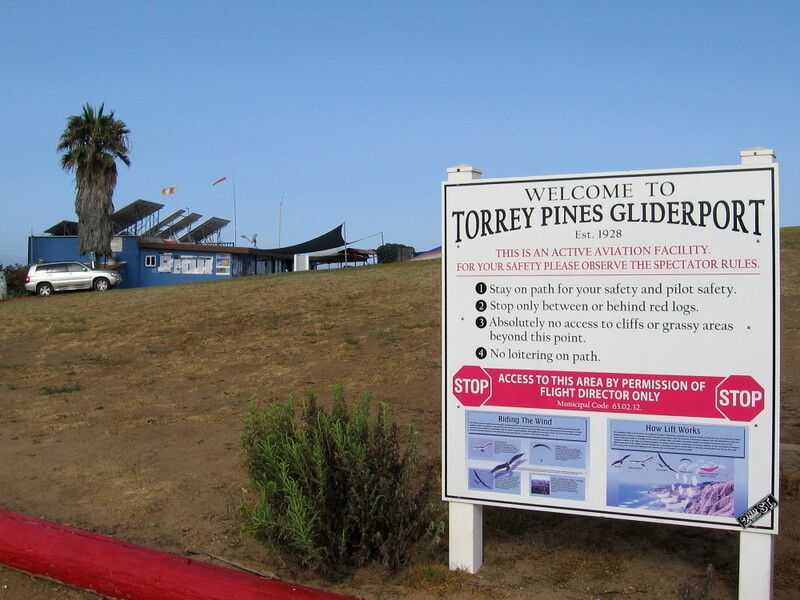 The Torrey Pines Gliderport was established in 1928 and is an active aviation facility. 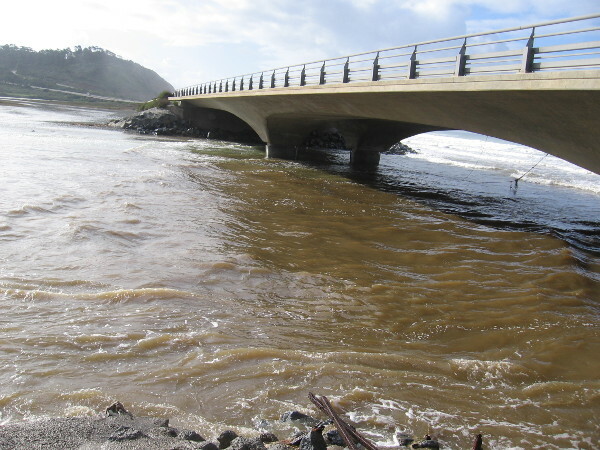 It’s also a favorite place to enjoy incredible natural scenery and perhaps get a bite to eat. 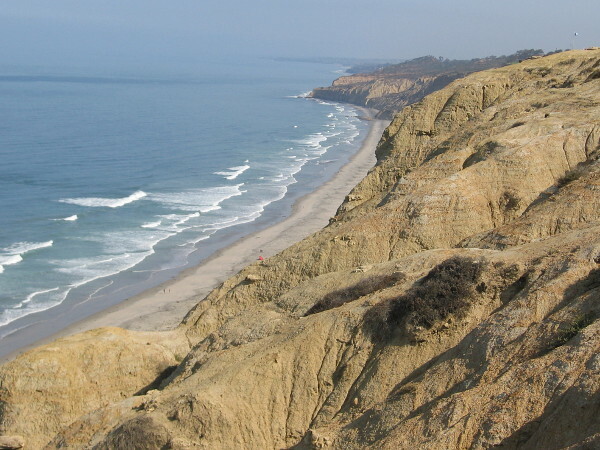 Looking north along the San Diego coast from a point above Black’s Beach. 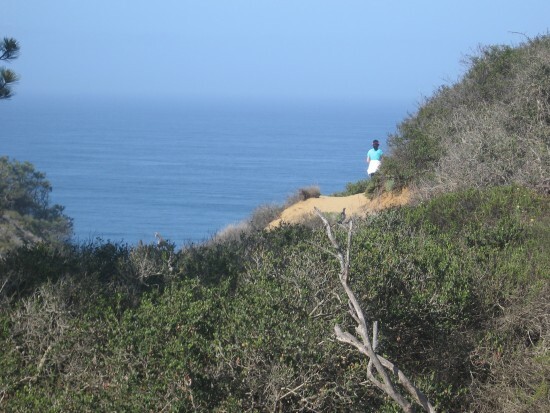 A solitary figure looks out at the mighty ocean from atop a weathered sandstone cliff. 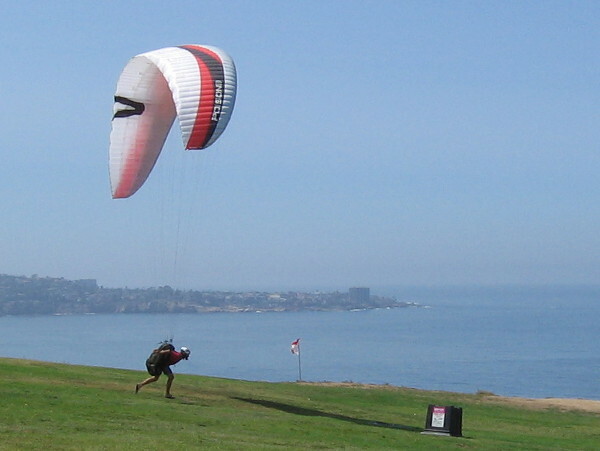 A hang glider is moved on the grassy hill near the Gliderport. 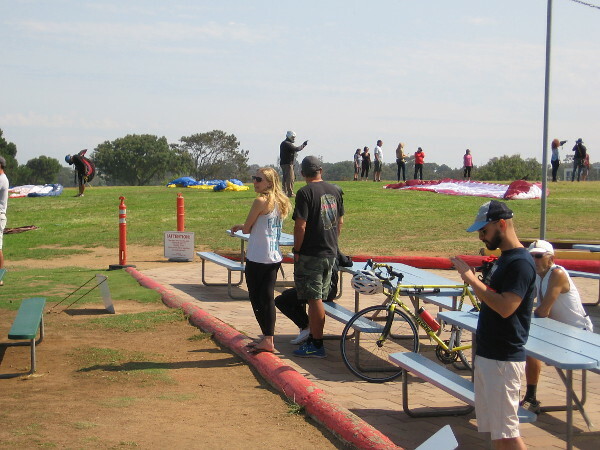 Students, instructors and experienced gliders alike must wait for a good, steady wind. While I wandered about I made a cool discovery! 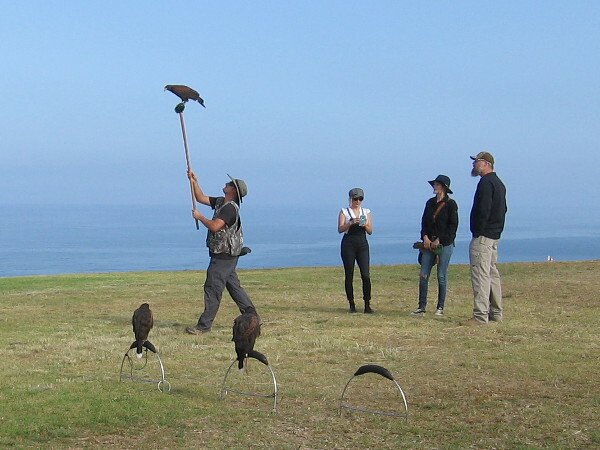 Atop the hill beside the Torrey Pines Gliderport, the experts of Sky Falconry were getting ready to teach a morning class. 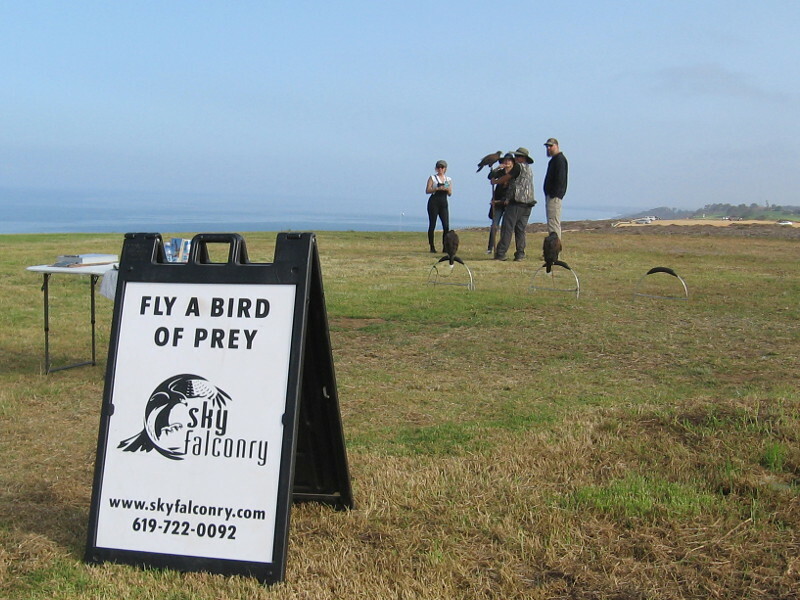 Anyone can fly a bird of prey! 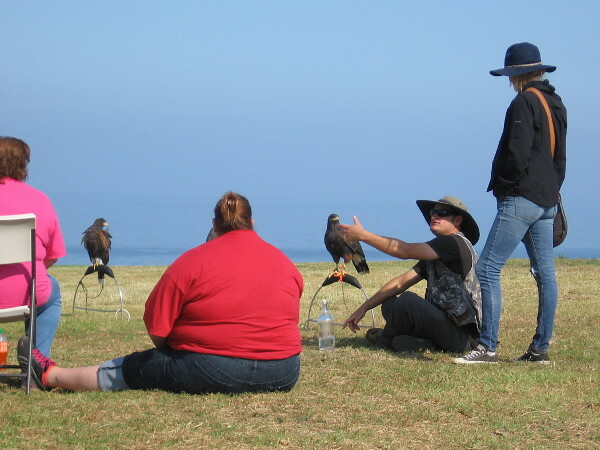 Several hawks trained to fly and return on command have a chance to stretch their wings before the class of falconry students arrives. Taking flight indeed! 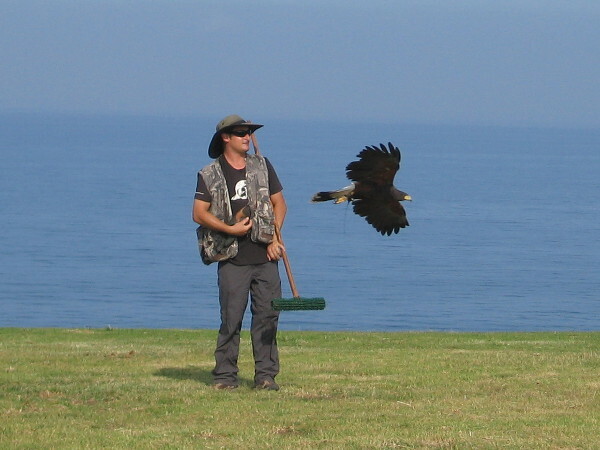 A beautiful raptor flies past its handler. Beyond, the blue Pacific Ocean stretches to the horizon. 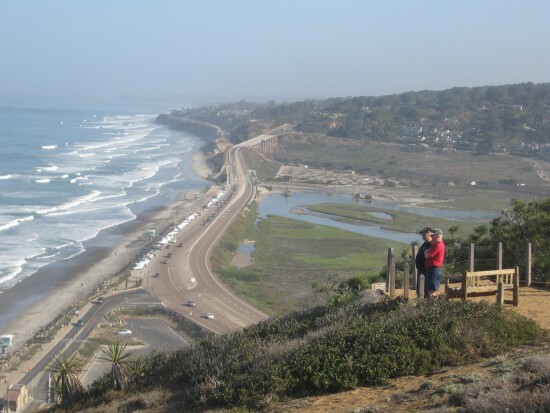 A view looking south from the Torrey Pines Gliderport. 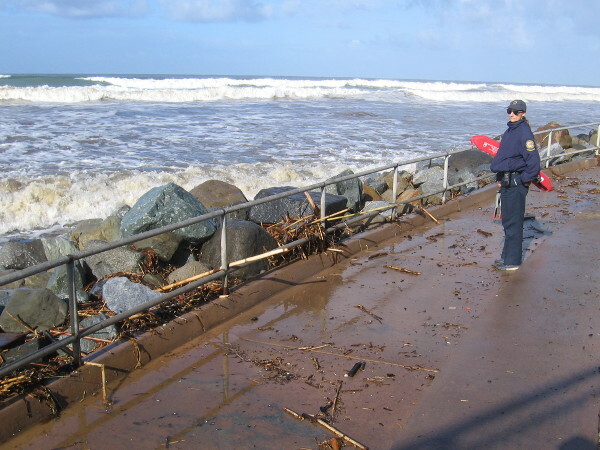 Someone stands on the lifeguard perch that overlooks the beach below. 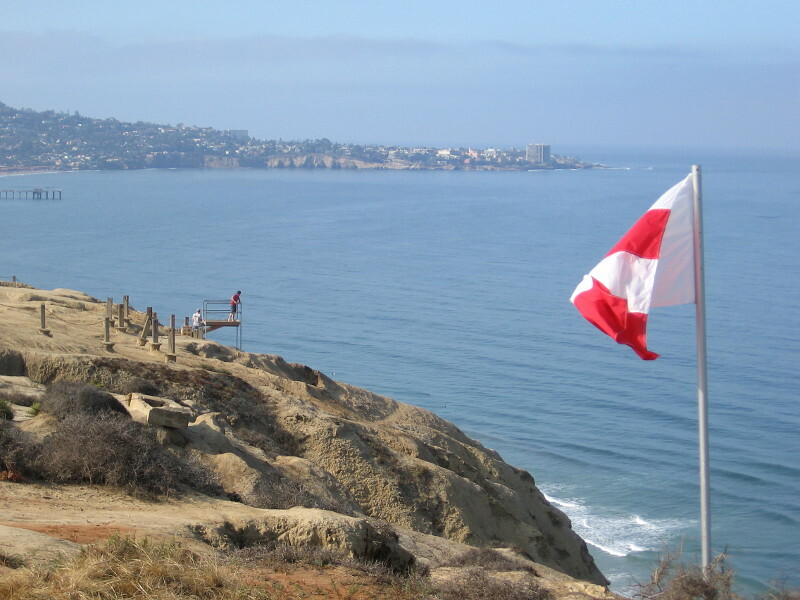 La Jolla Cove and the end of Scripps Pier can be seen in the background. Some activity! 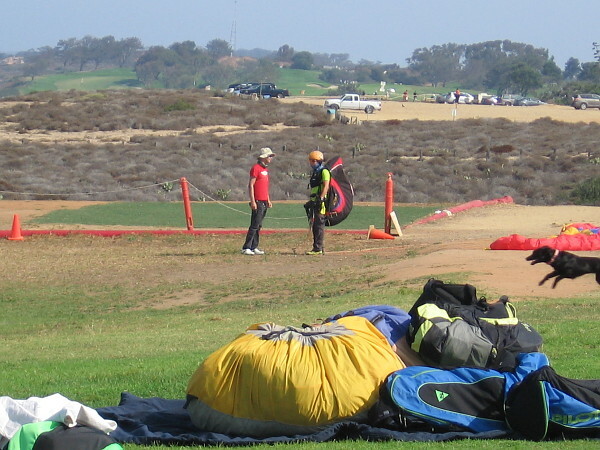 Someone wearing a bulky but lightweight paragliding harness sets out across the grass from the patio area at the Torrey Pines Gliderport. 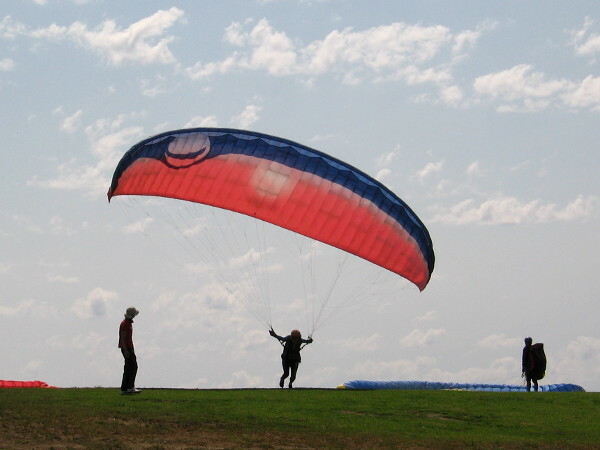 Students have begun to learn the basics of paragliding, including how to safely launch. Not enough wind to take to the air yet. 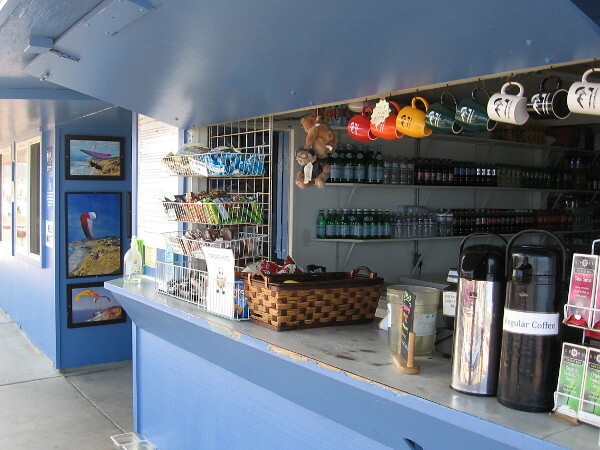 A quick photo through the Torrey Pines Gliderport’s casual patio area, with picnic benches. I spotted an outdoor grill and pool table nearby! The Giderport’s well-stocked Cliffhanger Café has yummy hamburgers . . . and jaw-dropping views just steps away! 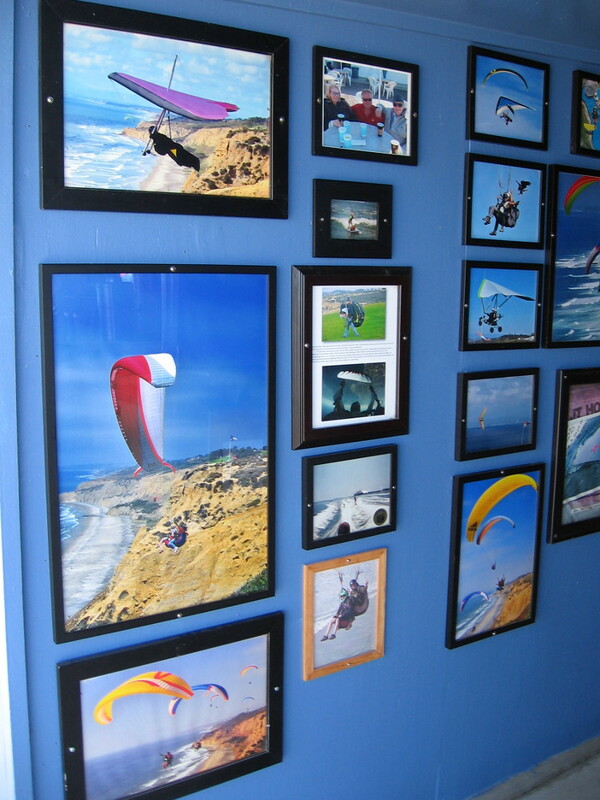 A short hallway that leads into the Torrey Pines Gliderport store features many photos of past hang gliding and paragliding adventures. 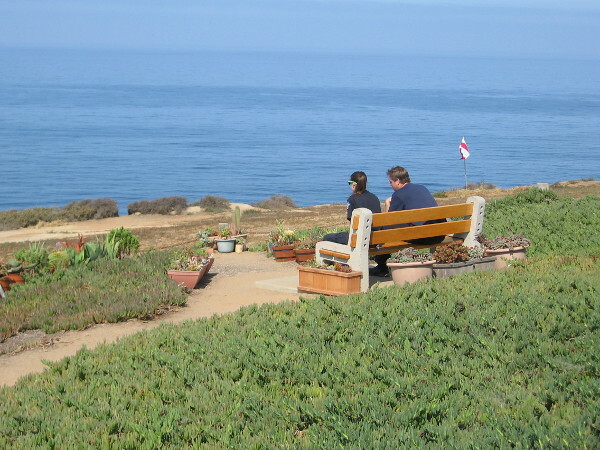 Just south of the Gliderport’s launch area, a bench makes a perfect place to experience sun, ocean and sea breeze. 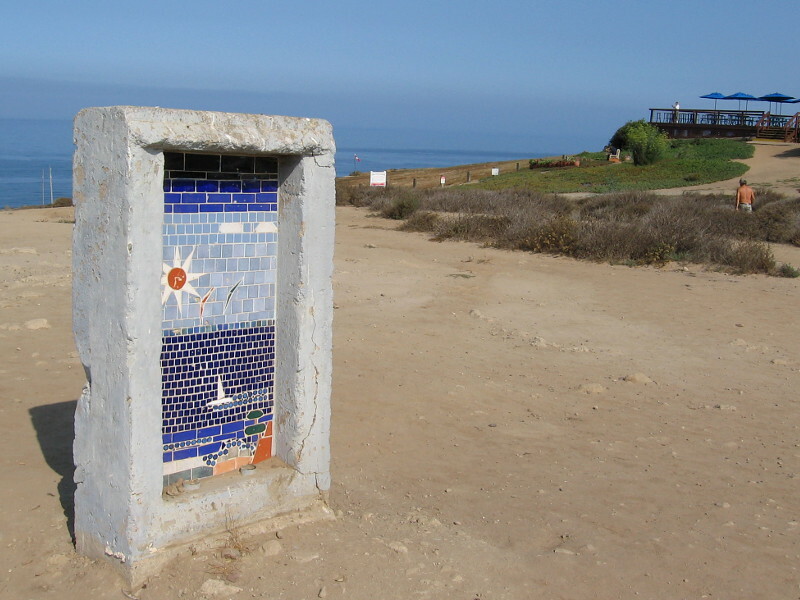 A forlorn concrete monument stands near the dirt parking lot, south of the Torrey Pines Gliderport. On one side a tile mosaic depicts a sailboat and gliders in the sky. 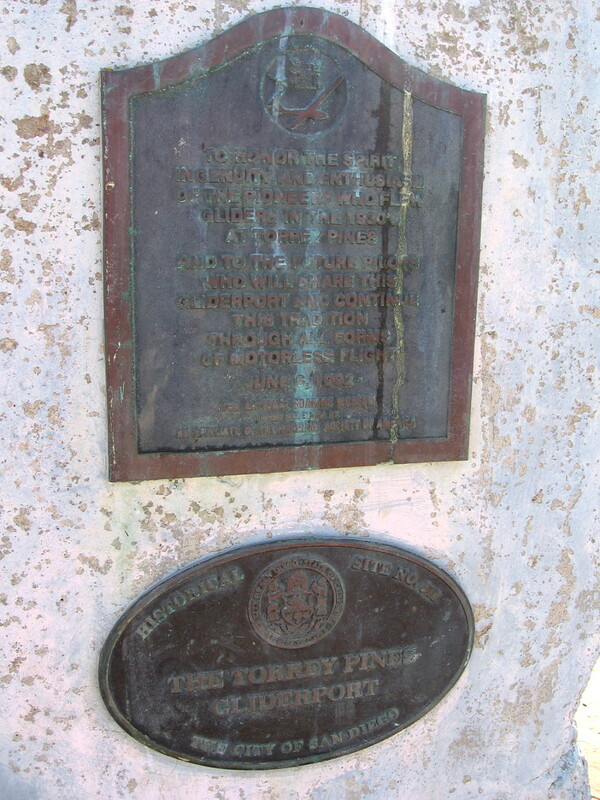 On the opposite side is a corroded historical marker. 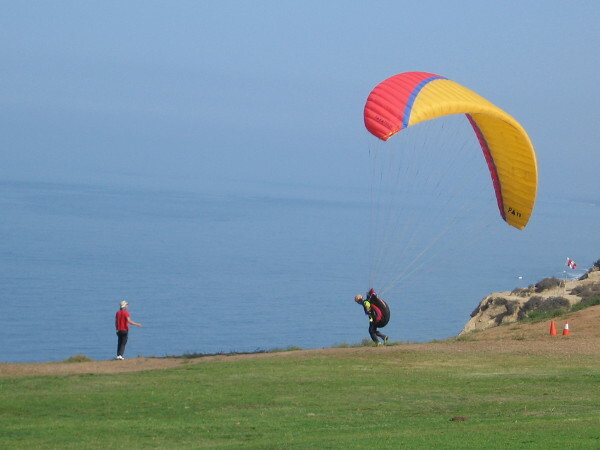 To honor the spirit, ingenuity, and enthusiasm of the pioneers who flew gliders in the 1930’s at Torrey Pines. Another look north at beautiful high cliffs of eroded sandstone. 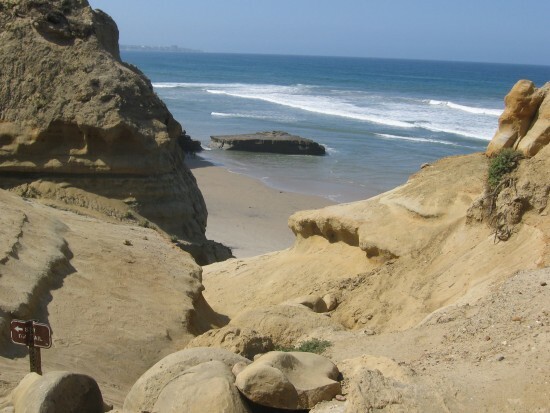 The coastline melts away into San Diego’s North County. No gliders yet! 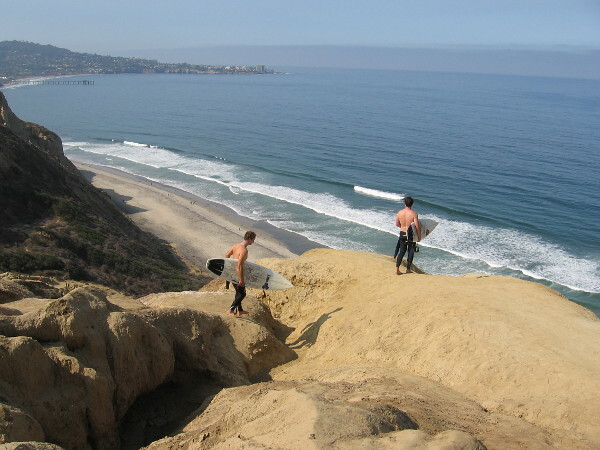 A couple of surfers prepare to descend the cliff to Black’s Beach far below. For those who don’t follow the established trail, it can be a very treacherous descent, and one occasionally sees rescues on the local news. 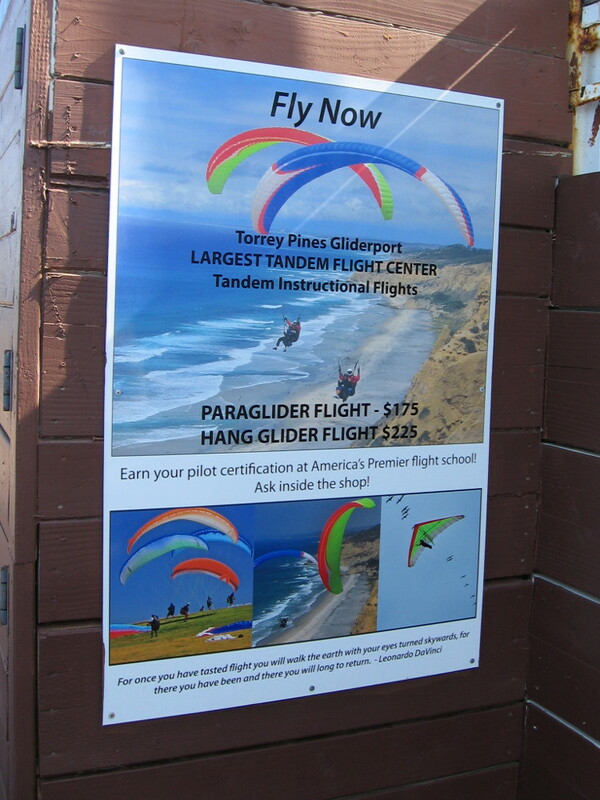 The Torrey Pines Gliderport bills itself as America’s premier flight school. 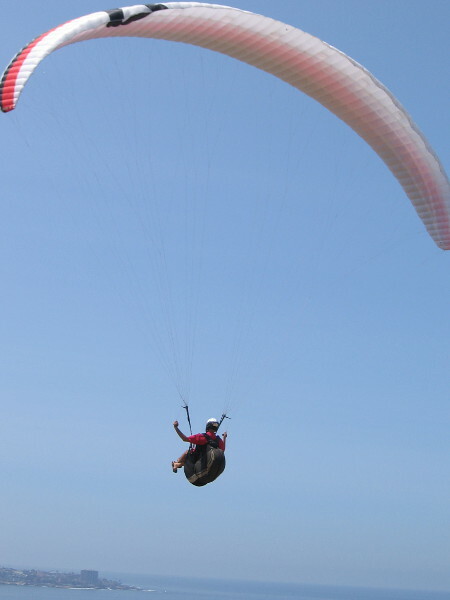 One can enjoy tandem paraglider and hang glider flights with an expert instructor. The breeze has picked up a bit. More students are trying out their equipment on safe land. A happy dog is loving life. 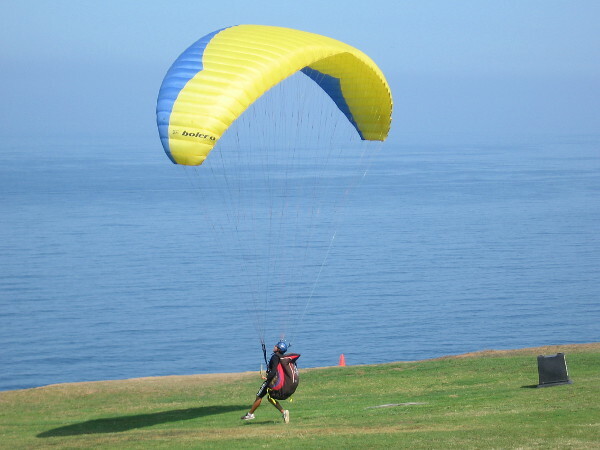 A paragliding student learns the ropes. 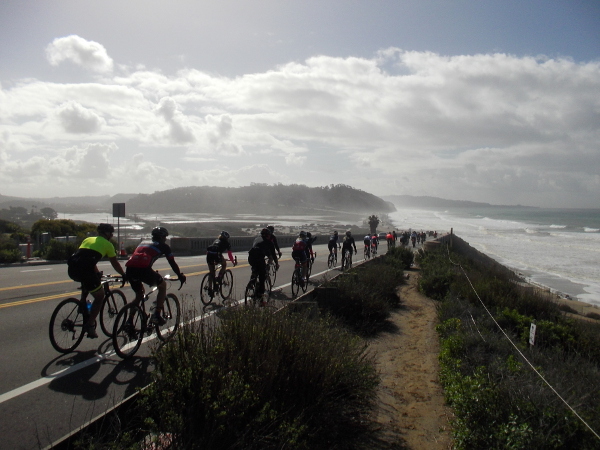 In the distance you can see the equally famous Torrey Pines Golf Course, which hosted the epic 2008 U.S. Open. More spectators have arrived and the nearby grassy hill has become more active. The falconry class is still underway. 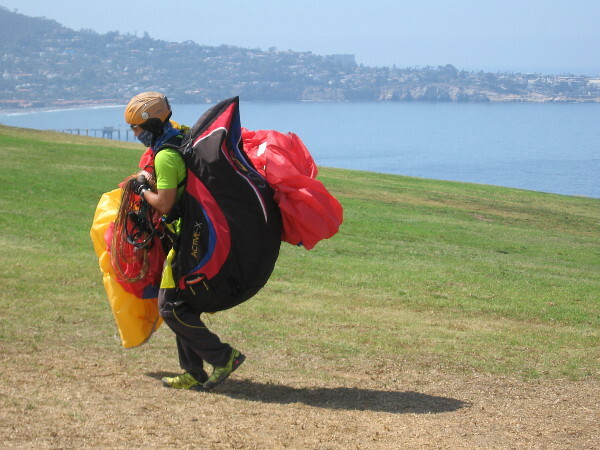 Carrying all the paragliding gear back up the hill. 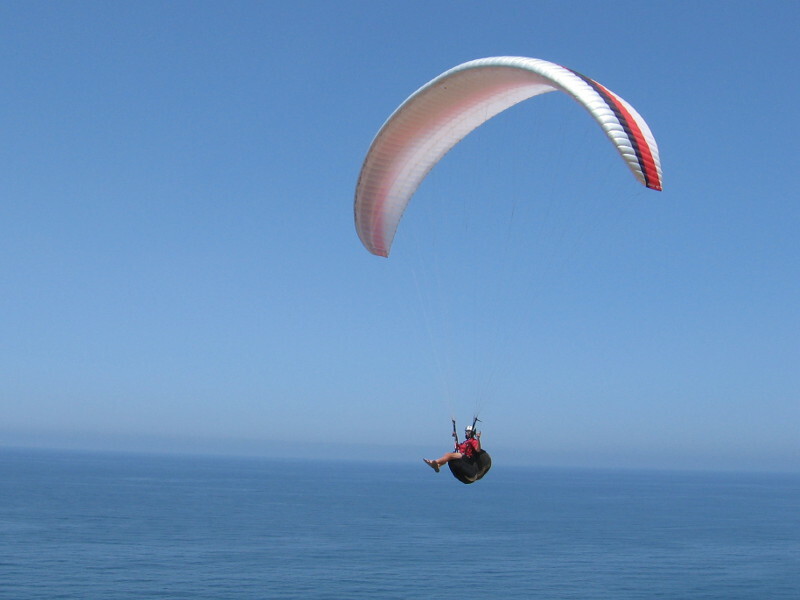 When actually gliding, if too much elevation is lost, some gliders will land on the beach. 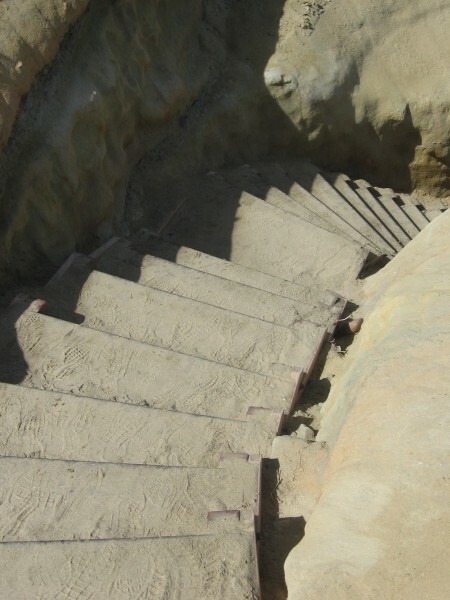 Then the climb is much, much worse! Just a cool shot of a paraglider spreading her wings. Finally! The breeze is pretty good now! The first paraglider is ready to launch! Lift is provided by wind that pushes up against the long cliffside. And he’s off, among the birds! A tranquil ride above and through the beautiful blue. 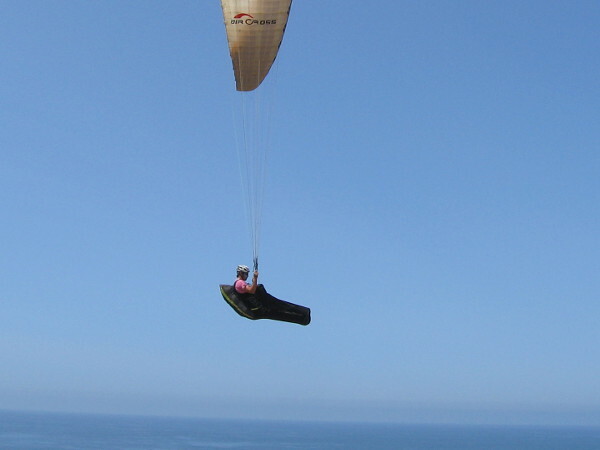 Paragliders wind their way back and forth along the cliffs, catching the updraft. 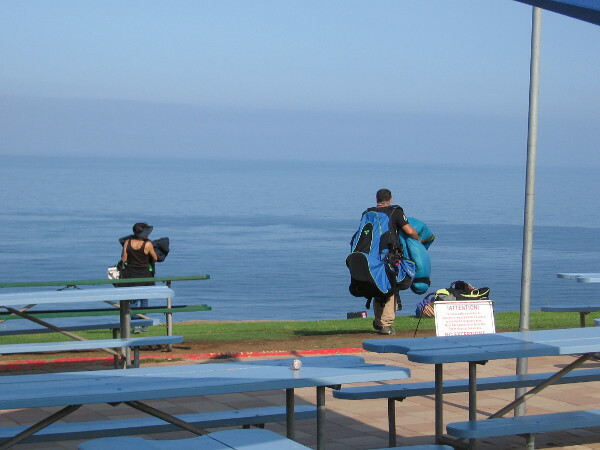 A photo that provides a hint of why the Torrey Pines Gliderport is such a special place. A fantastic ride through the sky! Another paraglider has joined the slow aerial dance. The lower part of his body is enclosed in a cool-looking pod harness. 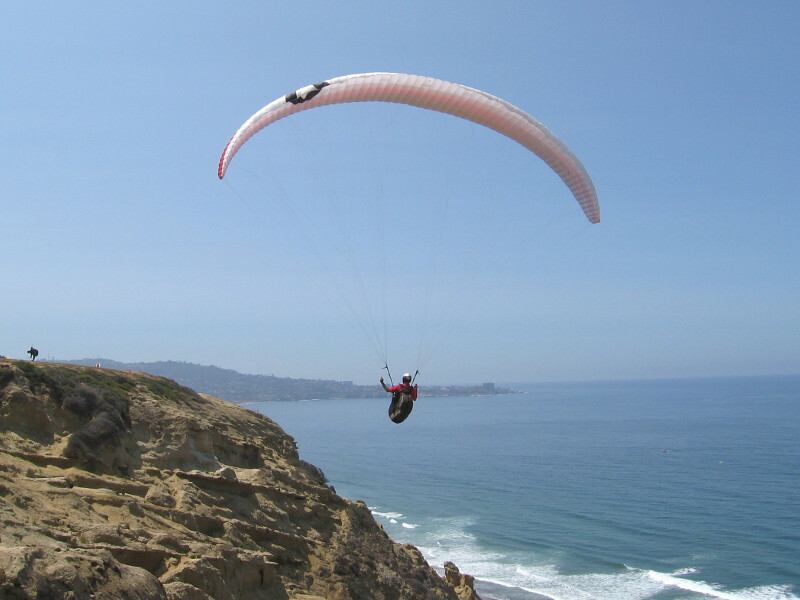 Paragliding above Black’s Beach, a favorite destination for surfers and Southern California nudists! 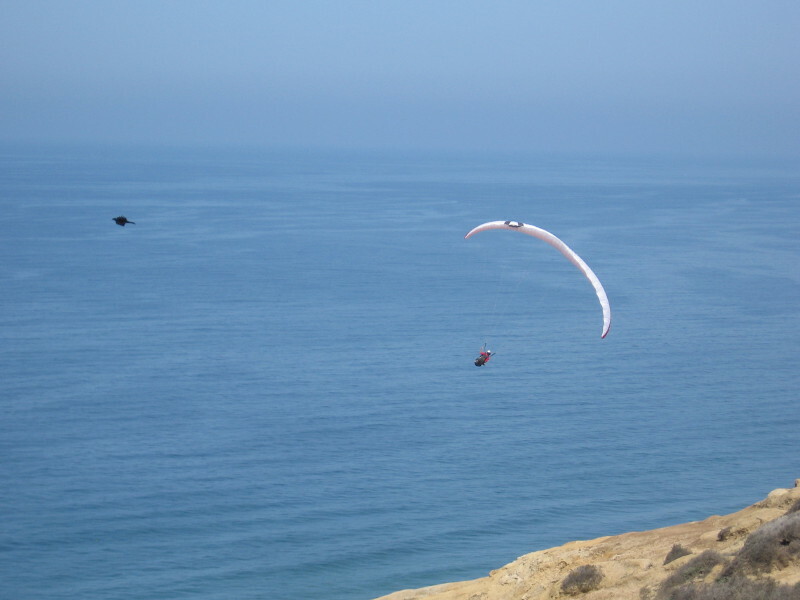 Posted on August 21, 2016 August 22, 2016 Tags beauty, birds, cool, hang gliding, pacific ocean, paragliding, photography, recreation, san diego, sky, sports, torrey pines, tourism, travel6 Comments on Taking flight at the Torrey Pines Gliderport! 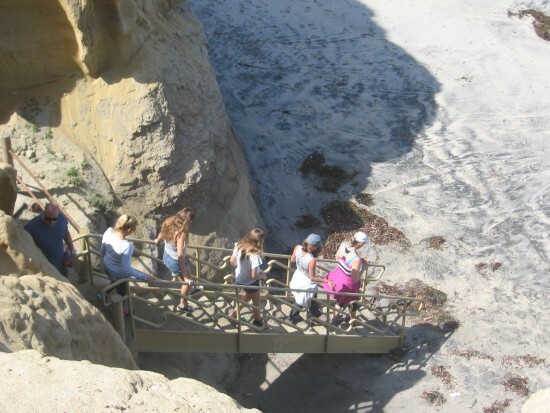 Hiking Torrey Pines State Reserve’s Beach Trail. 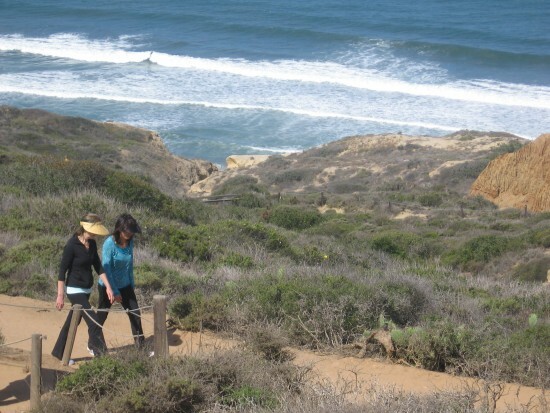 Hiking to the beach from a trailhead in Torrey Pines State Reserve. 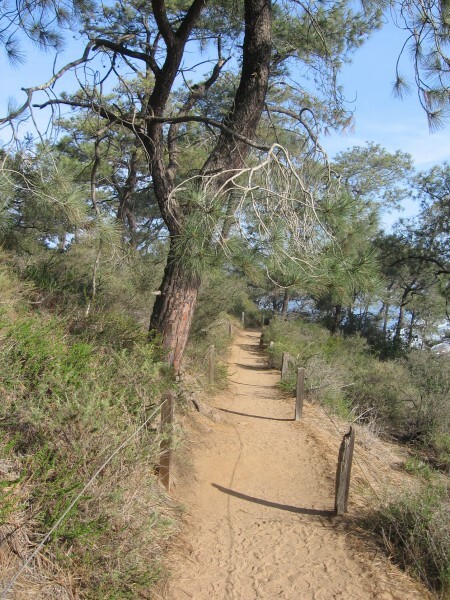 Today is National Trails Day, so it seems the perfect time to blog about one hike I took recently at Torrey Pines State Reserve! 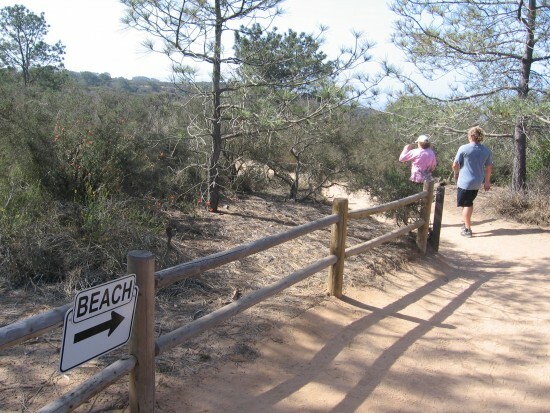 The hike was down the Beach Trail, which is one of the most popular hikes in this beautiful place. The coming photos demonstrate why! 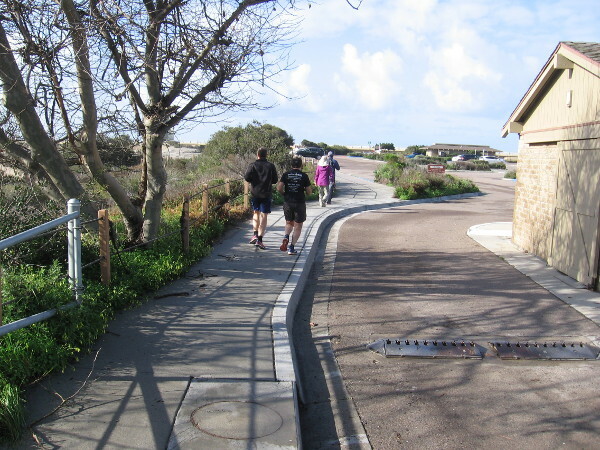 The 3/4 mile downhill Beach Trail begins at the edge of a small parking lot near the Torrey Pines State Reserve’s historic lodge, which serves as the visitor center. 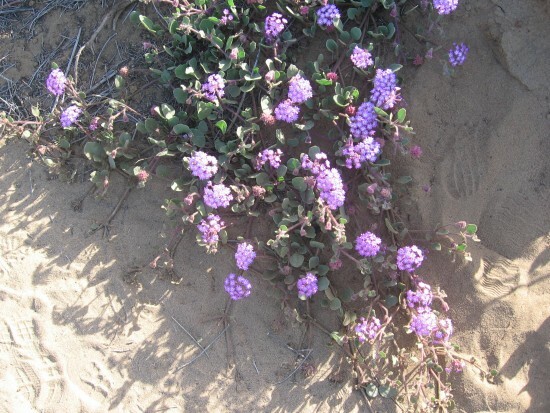 On this spring day, many small flowers were blooming along the trail, and lots of hikers were enjoying the sunshine as well. 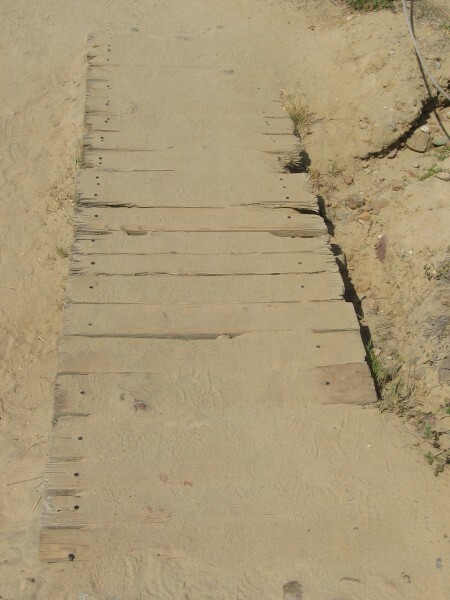 Should you ever go hiking here, make sure you wear good shoes because it can be a bit steep in places and the sand often makes slippery footing. 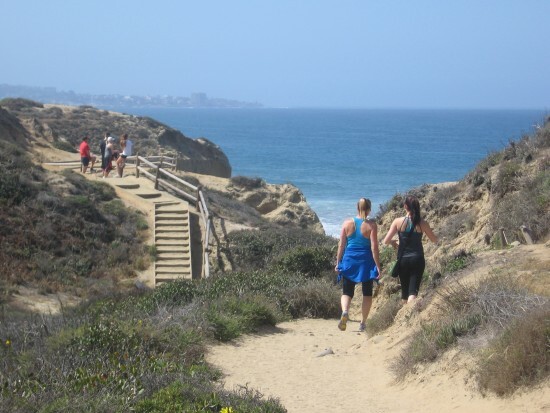 Hikers take beautiful trail through coastal chaparral. 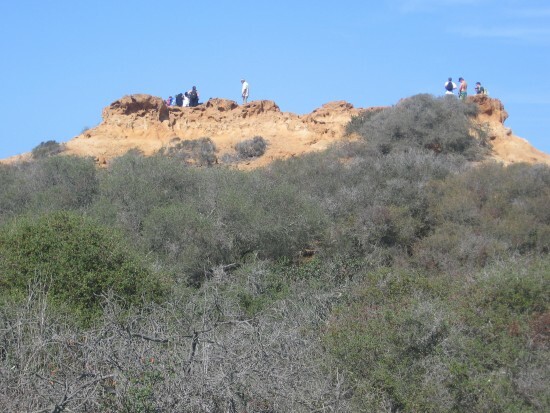 People enjoy vistas from atop sandstone formation. 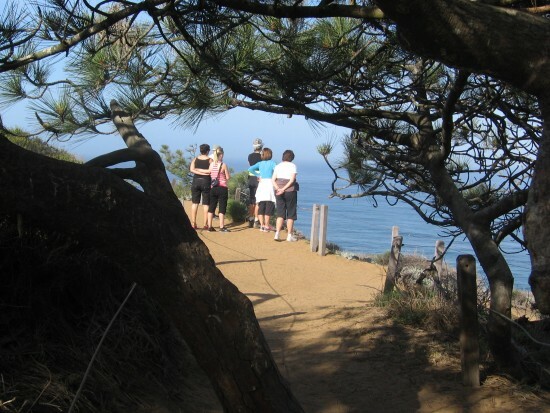 Endangered Torrey pine can be seen beyond fork in the trail. 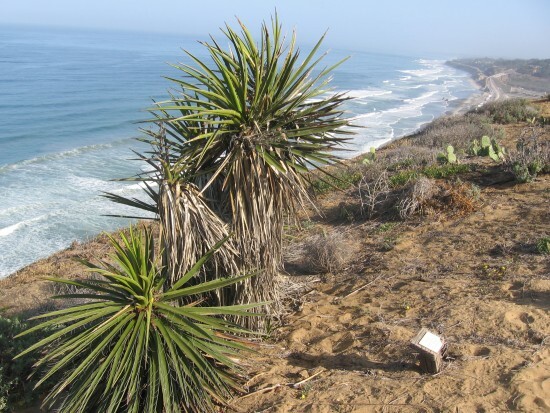 You can observe many more examples of the endangered Torrey pine tree in the north part of the reserve. 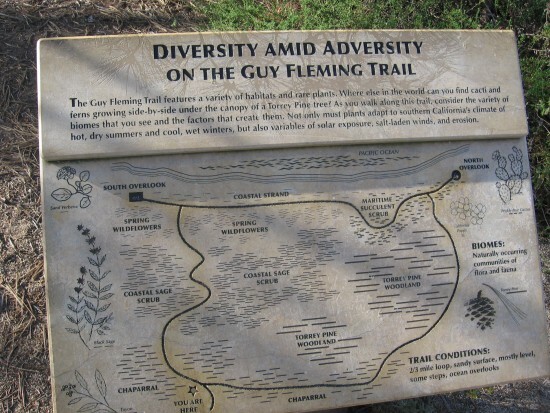 See my post about the Guy Fleming Trail! The blue Pacific Ocean comes into view! 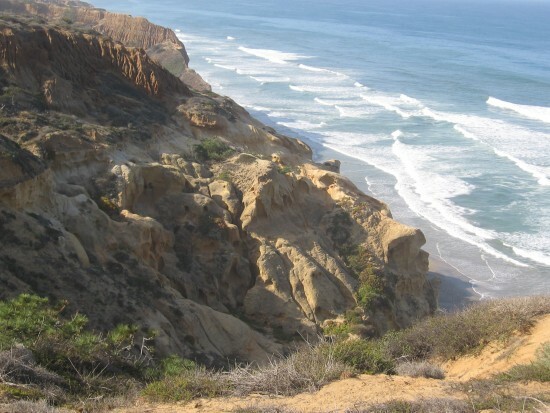 Typical rugged scenery along trails of Torrey Pines State Reserve. 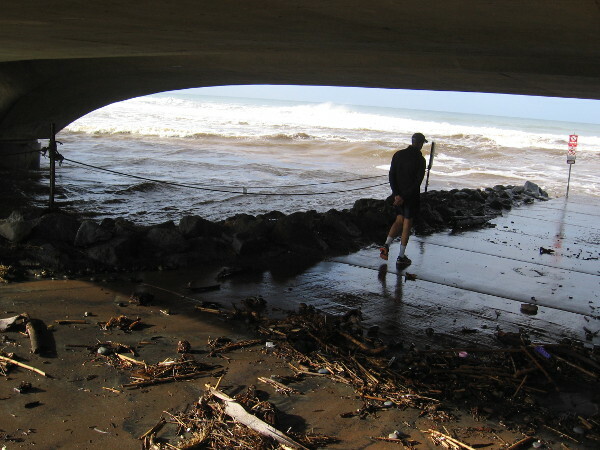 The Beach Trail is often covered in fine sand. Now we’re getting really close to our destination! 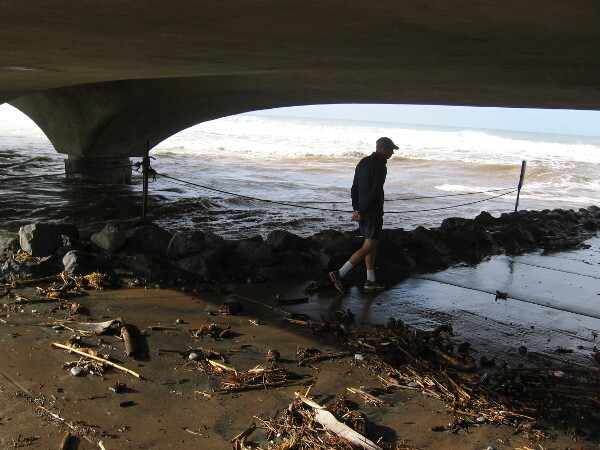 It gets much steeper as one approaches the ocean. You can see La Jolla way off in the hazy distance. 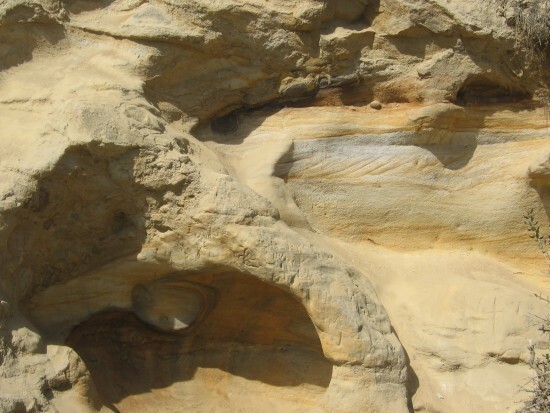 Erosion of layered sandstone creates unusual, fluid forms. 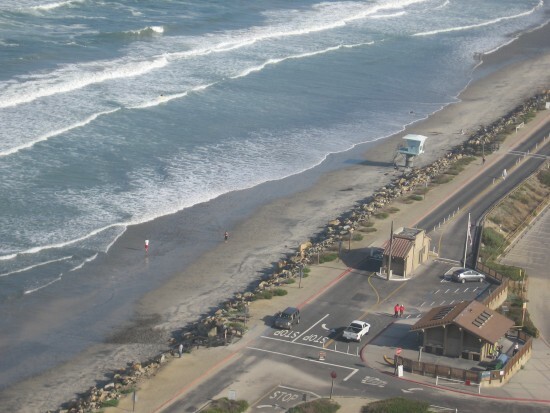 Flat Rock can be seen below on Torrey Pines State Beach. Steps head steeply down from cliffs. 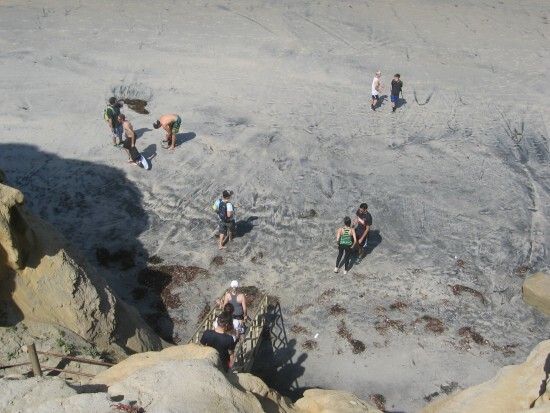 Hikers arrive at the beach! 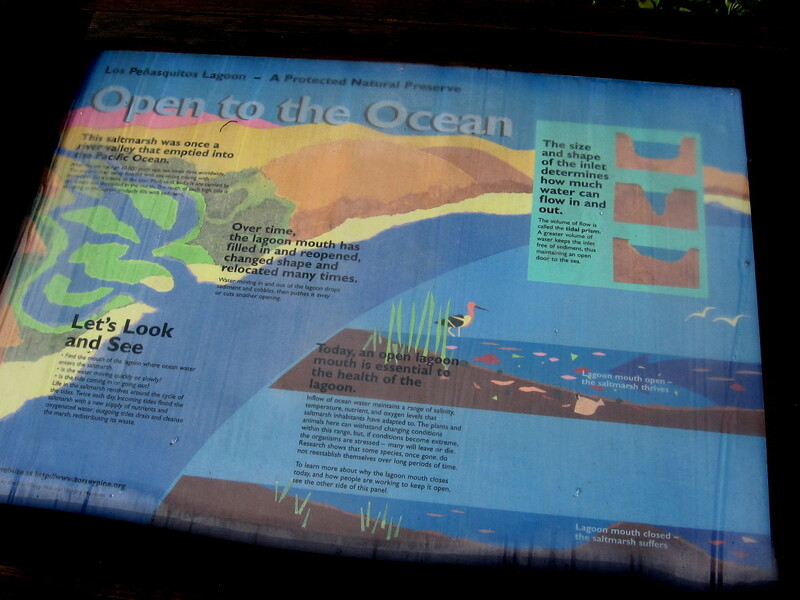 The transition from the reserve to the beach seems very sudden as you hike down from the cliffs. 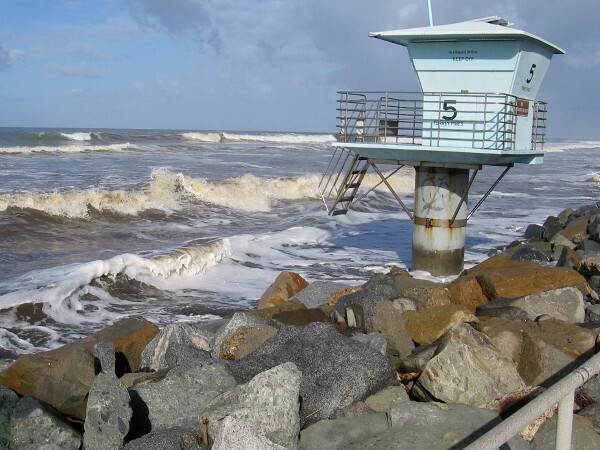 Suddenly you hear the surf and see many sea birds. It’s an amazing experience! 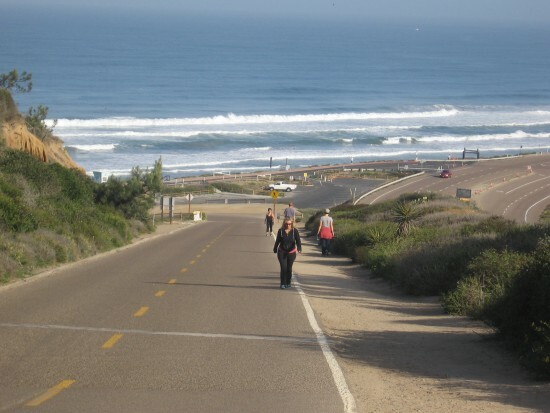 People walk north along Torrey Pines State Beach. 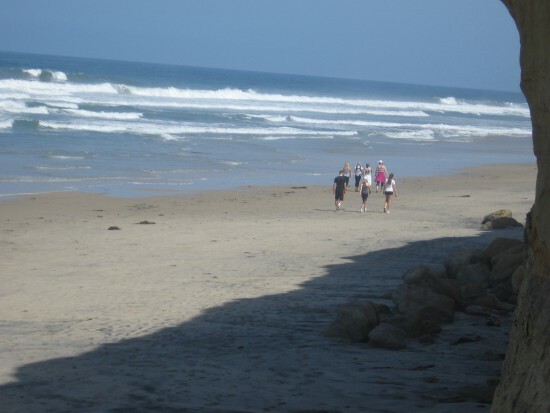 Posted on June 7, 2014 June 6, 2015 Tags beaches, beautiful, flowers, nature, pacific ocean, state parks, torrey pines, tourism, travel, walking2 Comments on Hiking Torrey Pines State Reserve’s Beach Trail. The historic Lodge at Torrey Pines State Reserve. 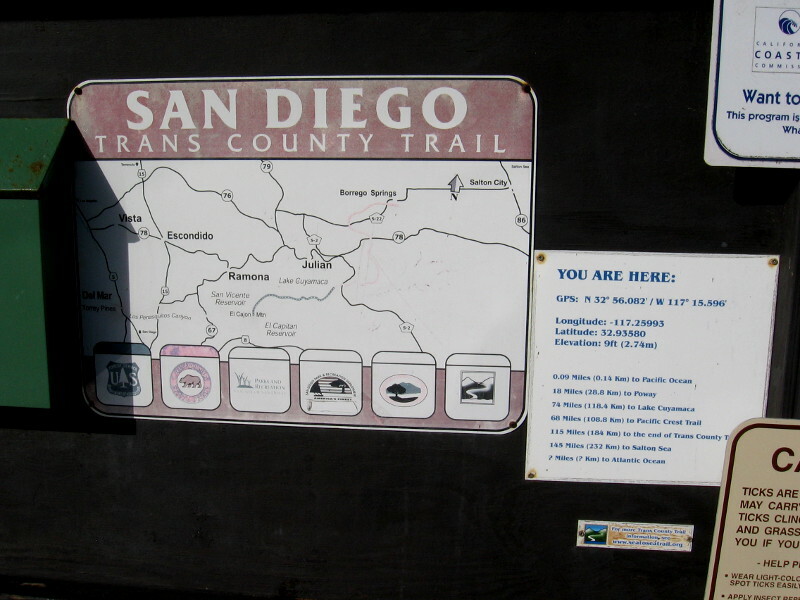 Sign at entrance to Torrey Pines State Reserve. 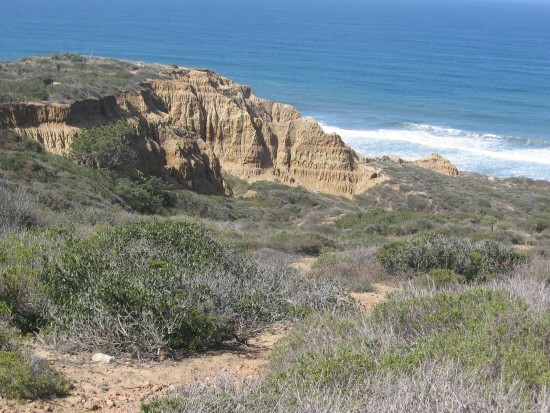 I hope you enjoyed my last blog post, where I described a hike around the Guy Fleming Trail in Torrey Pines State Reserve. Now I’d like to take you up to see the Lodge. 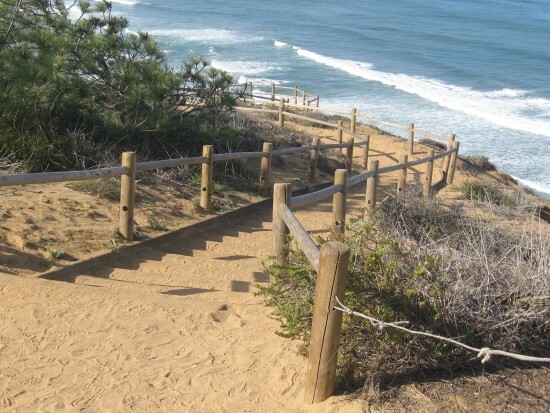 We’re going to start at the entrance of Torrey Pines State Reserve, just off the Pacific Coast Highway. 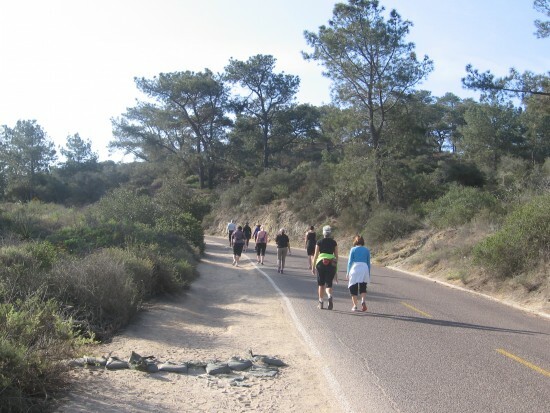 We’ll be climbing the steep Torrey Pines Park Road all the way to the historic Lodge. 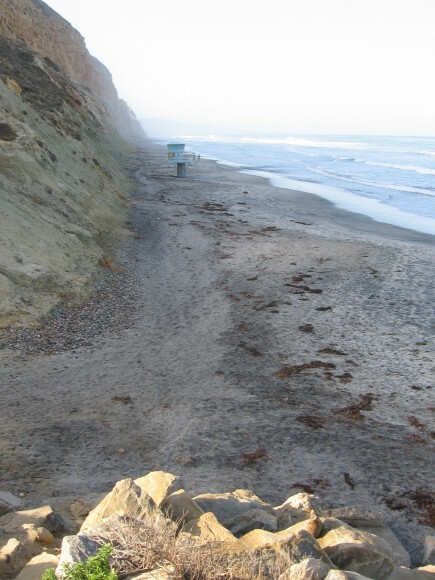 Looking south along Torrey Pines State Beach. As we begin our climb we bend away from the beach, but pause for a moment to observe the high sandstone cliffs to our south. This wonderful beach, which extends for many miles, will be the subject of a future blog post! Heading up steep Torrey Pines Park Road. Entering a zone full of endangered Torrey pines. 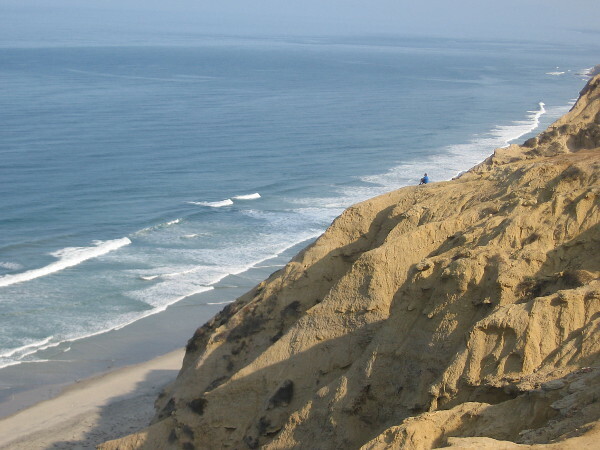 Torrey pines stand atop eroded sandstone cliffs. View of lagoon and ocean from High Point Overlook. Near the top of the road we come to High Point Overlook, a short trail that heads up some steps for a 360 degree view. 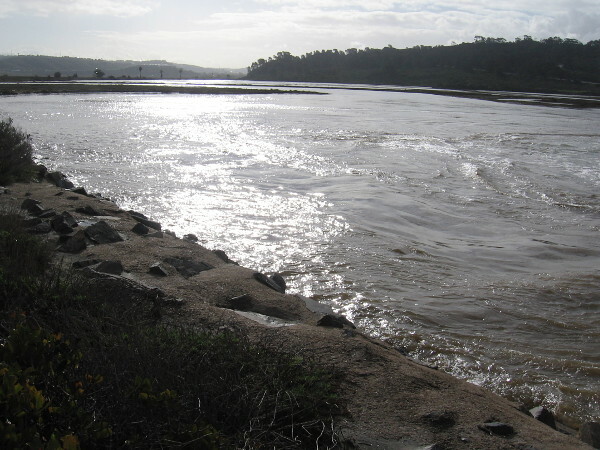 Here we’re looking north and seeing a bit of the Los Peñasquitos Lagoon. 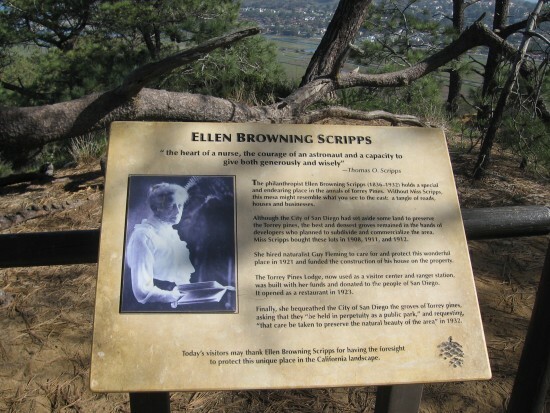 Sign about philanthropist Ellen Browning Scripps. 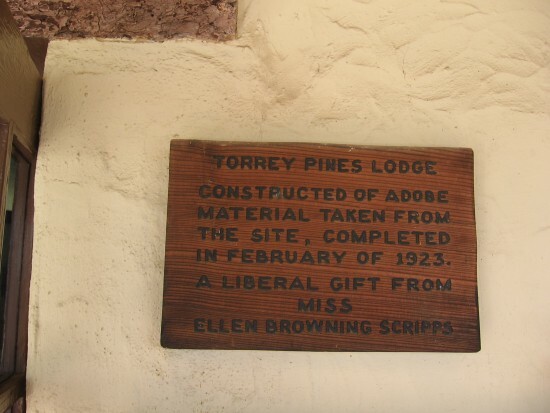 The philanthropist Ellen Browning Scripps (1836-1932) holds a special and endearing place in the annals of Torrey Pines. Without Miss Scripps, this mesa might resemble what you see to the east: a tangle of roads, houses and businesses. 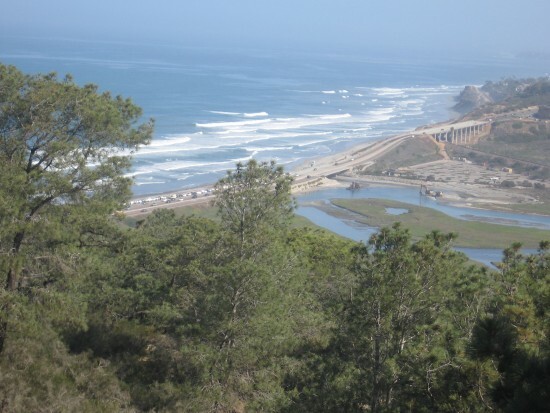 Although the City of San Diego had set aside some land to preserve the Torrey pines, the best and densest groves remained in the hands of developers who planned to subdivide and commercialize the area. Miss Scripps bought these lots in 1908, 1911, and 1912. 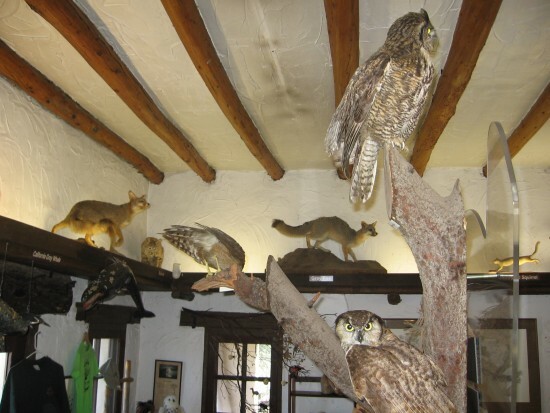 She hired naturalist Guy Fleming to care for and protect this wonderful place in 1921 and funded the construction of his house on the property. 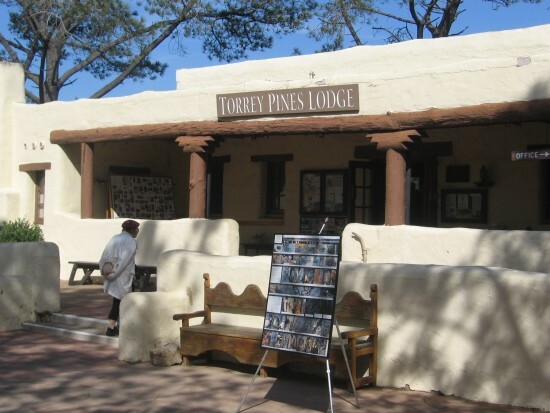 The Torrey Pines Lodge, now used as a visitor center and ranger station, was built with her funds and donated to the people of San Diego. It was designed by noted architects Richard Requa and Herbert Lewis Jackson. 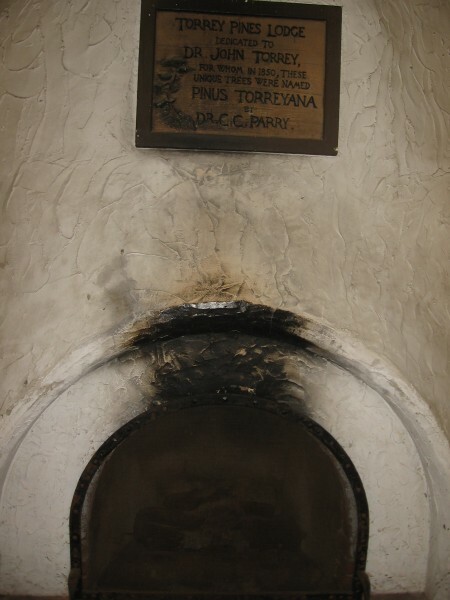 It opened as a restaurant in 1923. 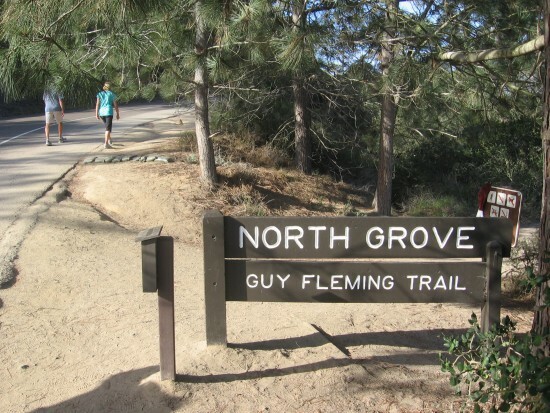 Finally, she bequeathed the City of San Diego the groves of Torrey pines, asking that they “be held in perpetuity as a public park,” and requesting, “that care be taken to preserve the natural beauty of the area” in 1932. 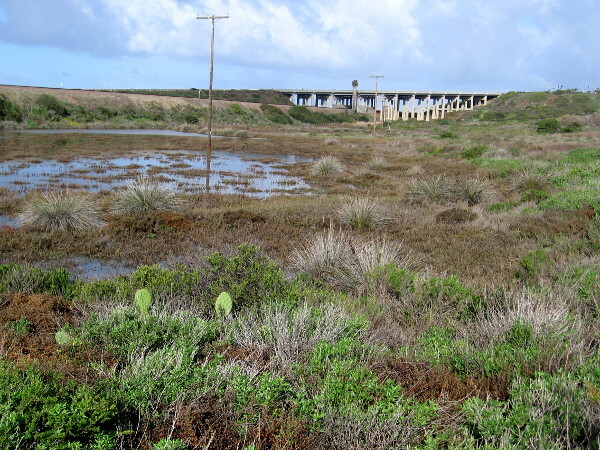 Today’s visitors may thank Ellen Browning Scripps for having the foresight to protect this unique place in the California landscape. 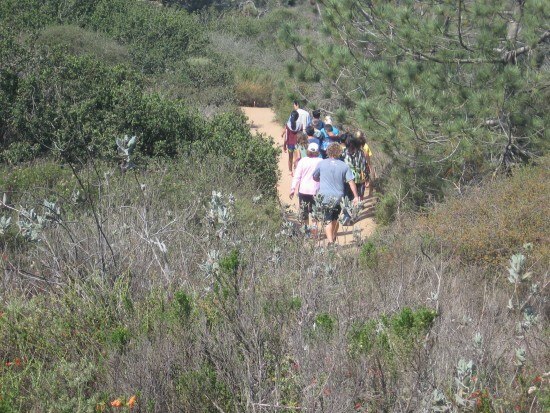 Nearing Torrey Pines State Reserve’s historic Lodge. A little more walking takes us to our main destination, the Lodge. 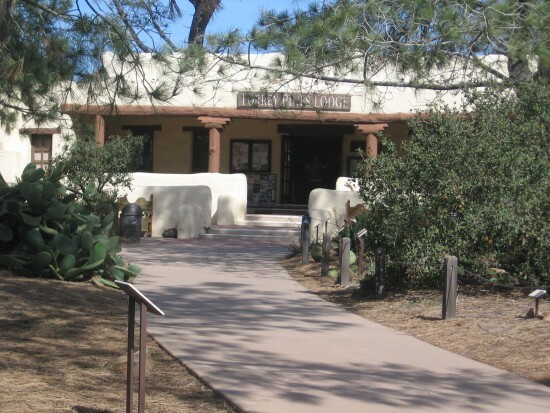 An old adobe built in 1922, it originally served as a restaurant! According to the official website, it had stumpy tables, chintz curtains, lampshades made of Torrey Pine needles, and a jukebox! Back in those days, Model T cars had difficulty going up the steep hill, because they didn’t have a fuel pump, and instead relied on a gravity system. When the steeply climbing cars conked out, drivers were told to continue up the hill in reverse! 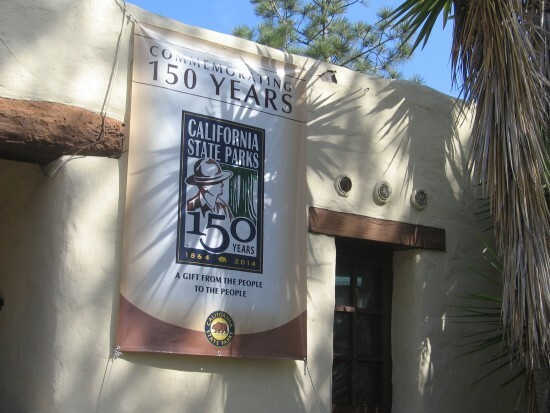 Banner commemorates 150 years of California State Parks. 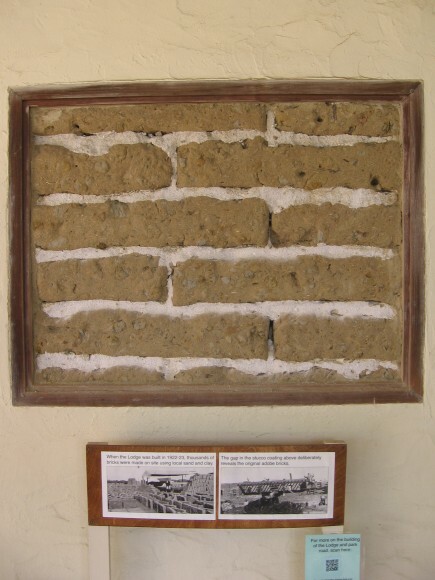 Gap in Lodge’s stucco shows original adobe bricks. When the Lodge was built in 1922-23, thousands of bricks were made on site using local sand and clay. The gap in the stucco coating above deliberately reveals the original adobe bricks. 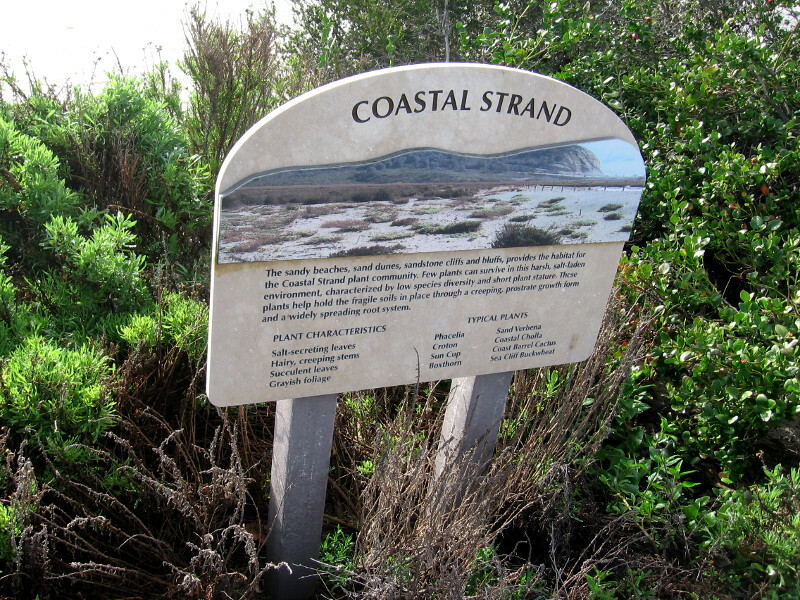 Portion of large sign outside describing coastal flowers. 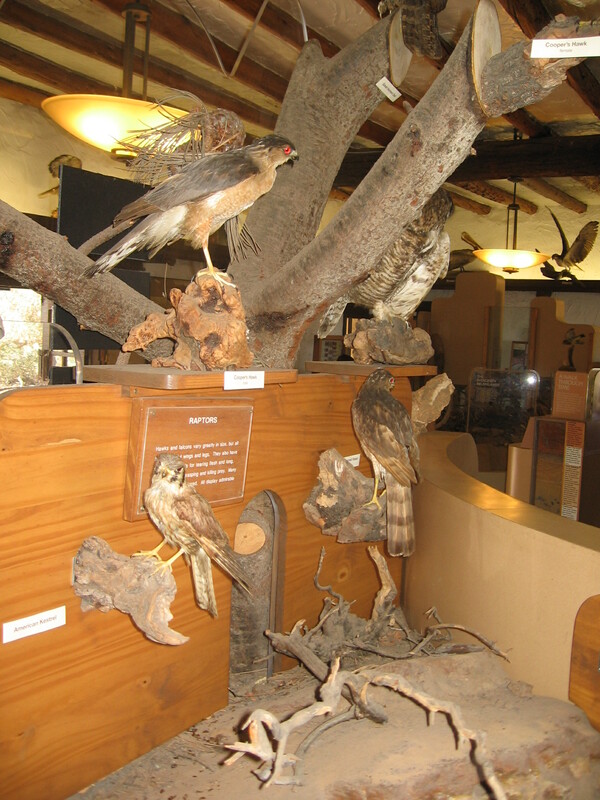 Interior of Lodge is a museum and visitor center. I love the interior of the Lodge. There’s so much interesting stuff to see, and so much history and natural charm jammed into one place. The Lodge is open daily 9 AM to 6 PM during summer daylight saving time and 10 AM to 4 PM during winter standard time. 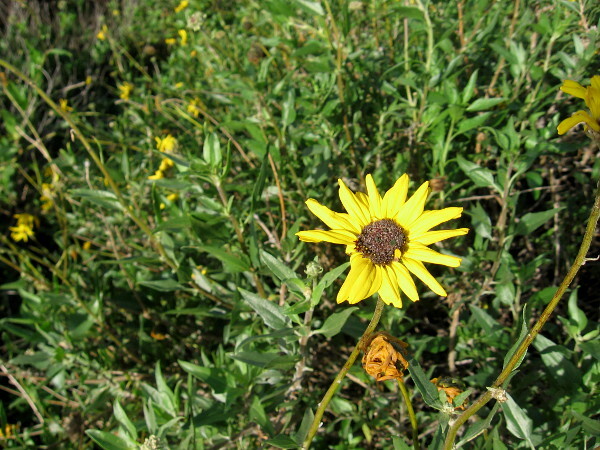 Ranger guided hikes are available on weekends. 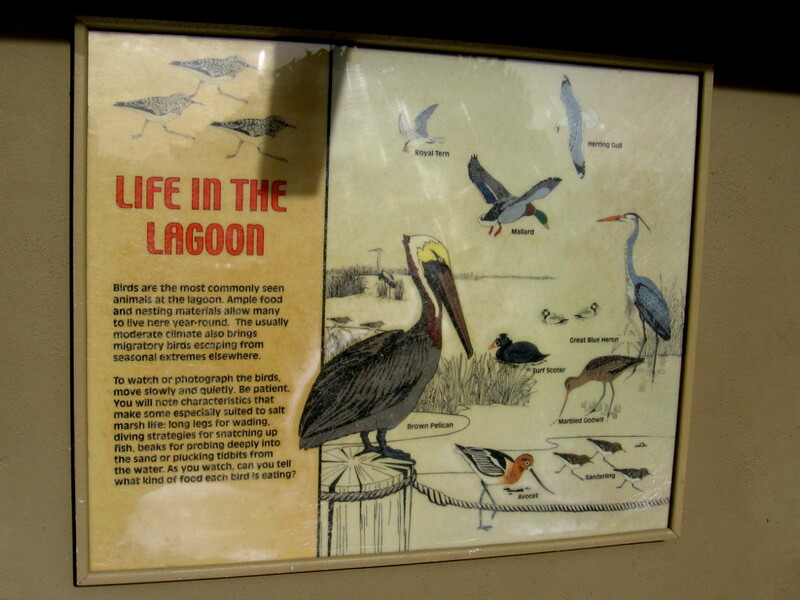 One of many educational exhibits. 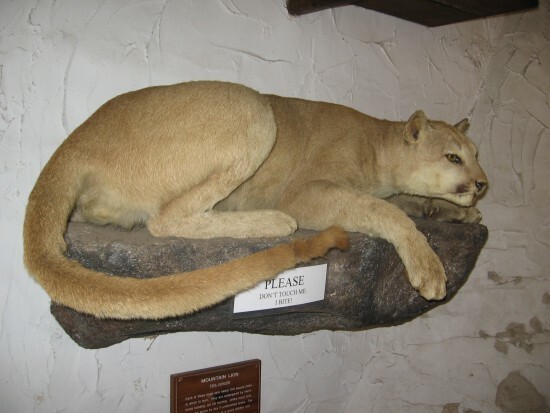 Mountain lion patiently watches visitors to the Lodge. Plaque in Lodge credits Ellen Browning Scripps. Old fireplace shows decades of use. Torrey Pines Lodge dedicated to Dr. John Torrey, for whom, in 1850, these unique trees were named Pinus torreyana by Dr. C. C. Parry. Sign behind Lodge describes Torrey pines woodlands. Now we’ve headed back outside, around the back of the Lodge. 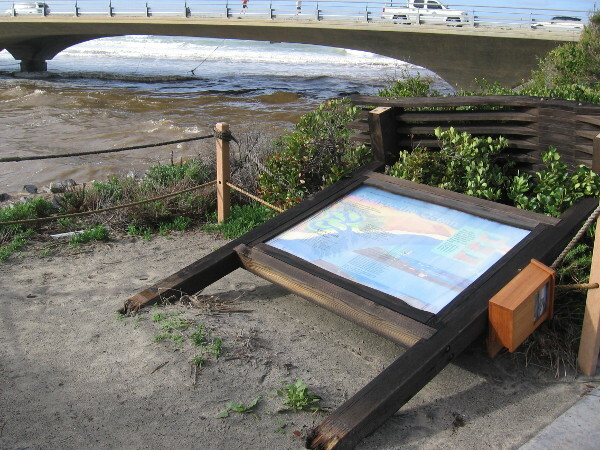 Numerous Torrey pines are all around us, and benches are sprinkled here and there with sweeping views eastward toward developed Carmel Valley and Interstate 5. 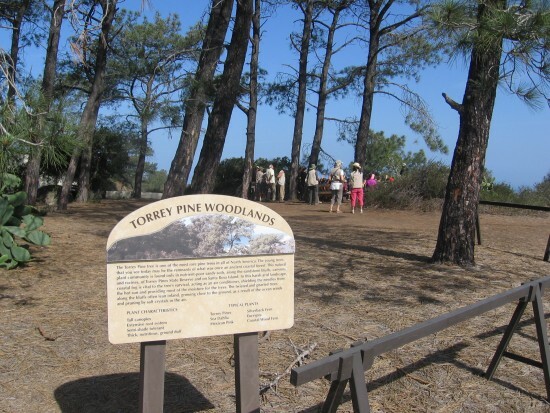 The Torrey Pine tree is one of the most rare pine trees in all of North America. 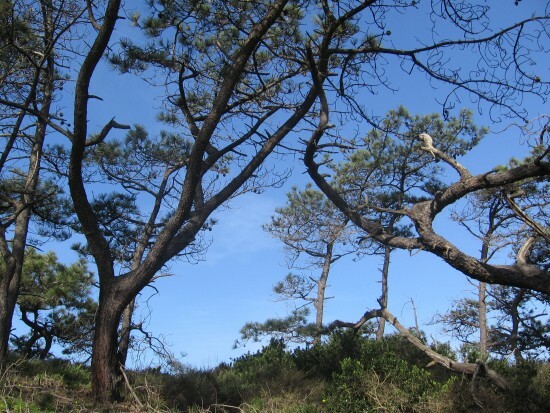 The young trees that you see today may be the remnants of what was once an ancient coastal forest. 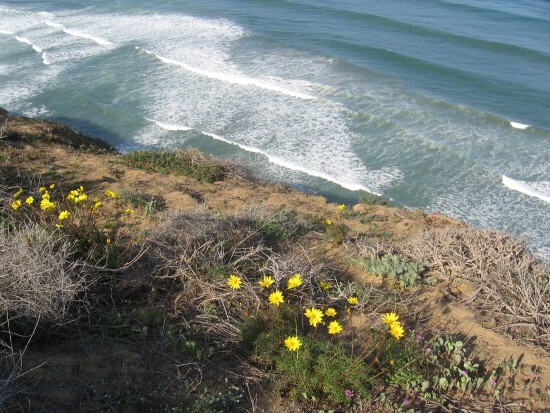 This natural plant community is found only in nutrient-poor sandy soils, along the sandstone bluffs, canyons, and ravines, of Torrey Pines State Reserve and on Santa Rosa Island. 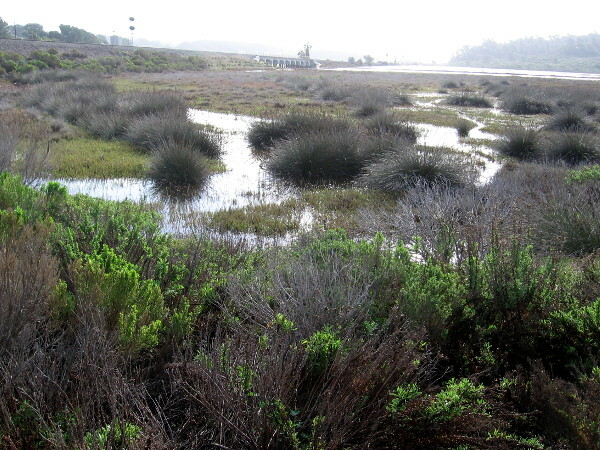 In this harsh arid landscape, coastal fog is vital to the tree’s survival, acting as an air conditioner, shielding the needles from the hot sun and providing most of the moisture for the trees. 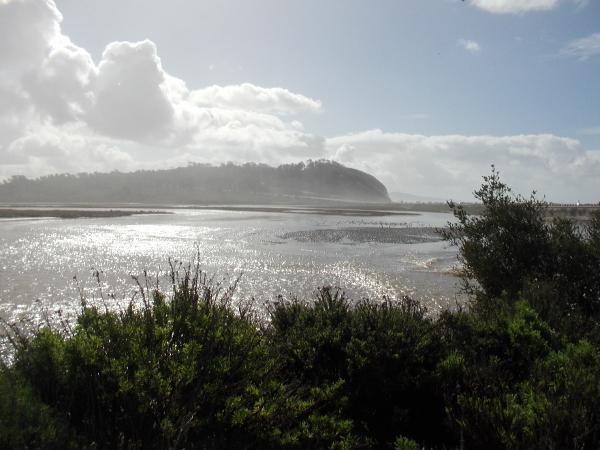 The twisted and gnarled trees along the bluffs often lean inland, growing close to the ground, as a result of the ocean winds and pruning by salt crystals in the air. 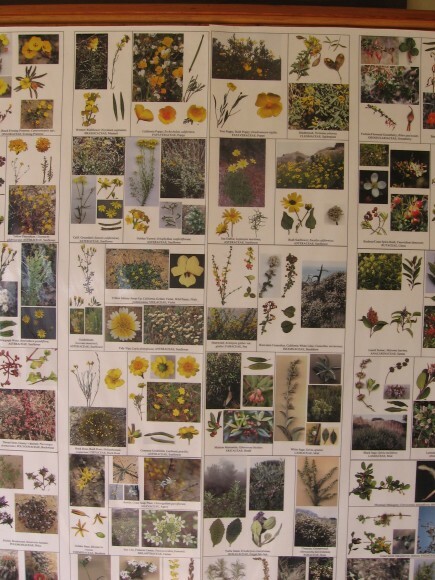 School kids learn about local flora and fauna. 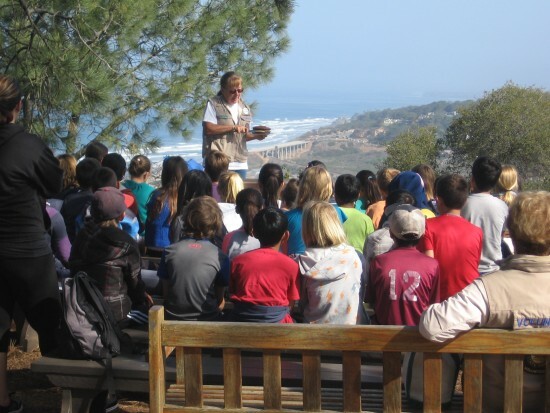 A ranger was giving a bunch of school kids a talk about Torrey Pines State Reserve. They’ll remember this special place for the rest of their lives. 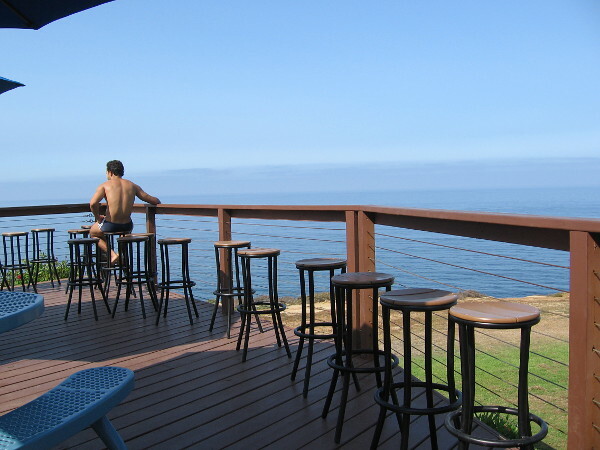 The Lodge at Torrey Pines State Reserve is a must see! 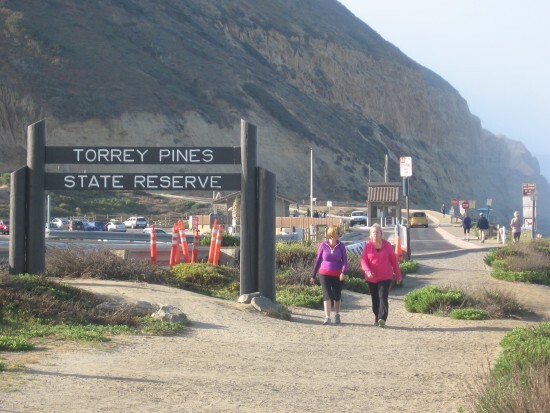 Posted on April 25, 2014 January 20, 2018 Tags beautiful, buildings, education, history, kids, nature, outdoors, state parks, torrey pines, walking1 Comment on The historic Lodge at Torrey Pines State Reserve.